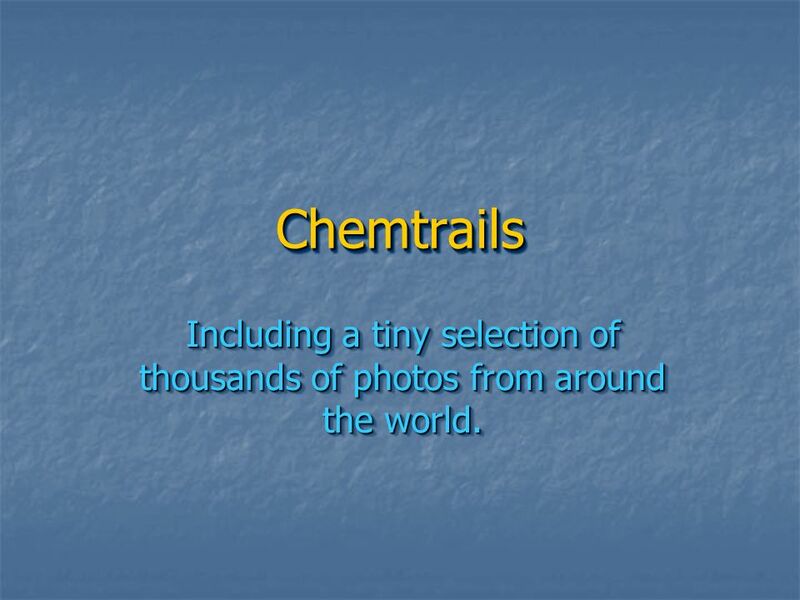 4 Chemtrails Including a tiny selection of thousands of photos from around the world. 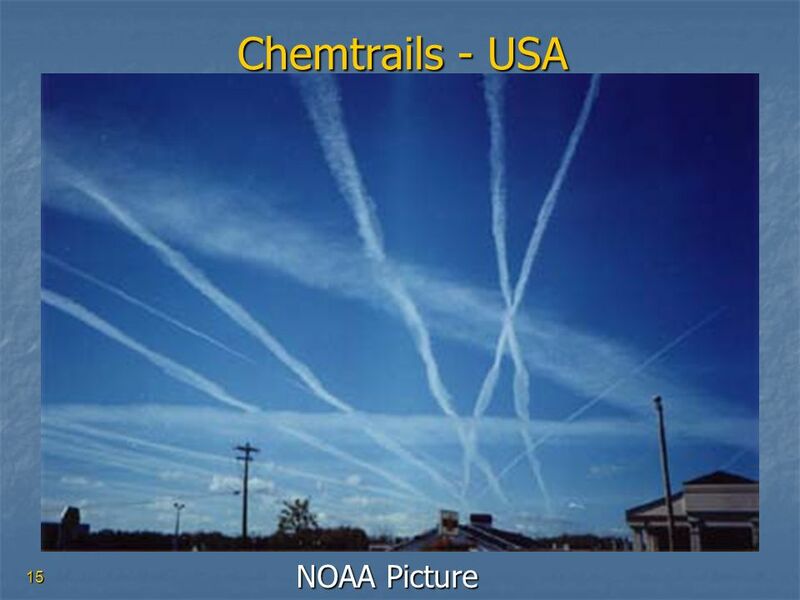 Word derived from “Chemical Trail” from aircraft. 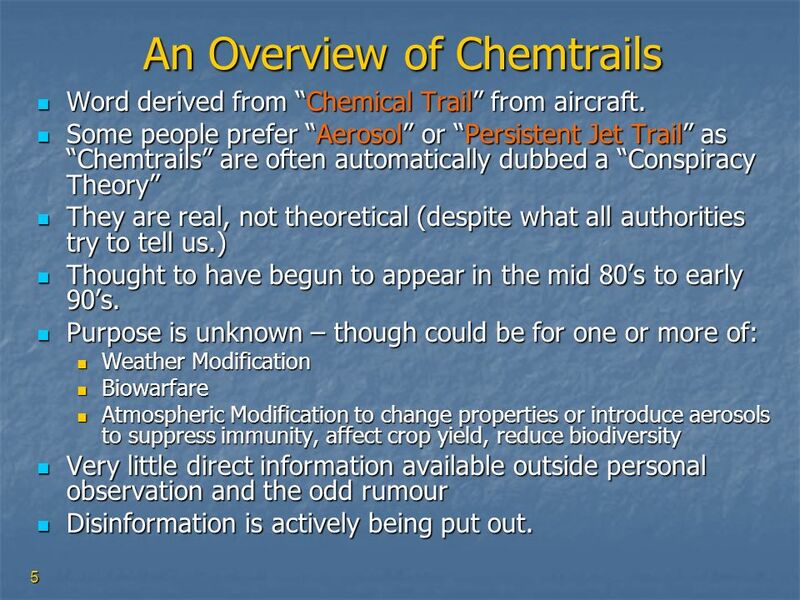 Some people prefer “Aerosol” or “Persistent Jet Trail” as “Chemtrails” are often automatically dubbed a “Conspiracy Theory” They are real, not theoretical (despite what all authorities try to tell us.) 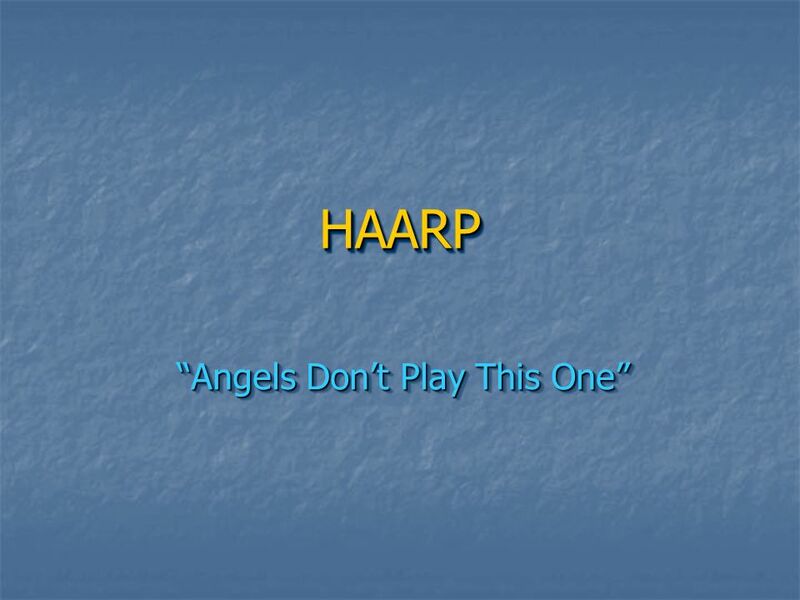 Thought to have begun to appear in the mid 80’s to early 90’s. 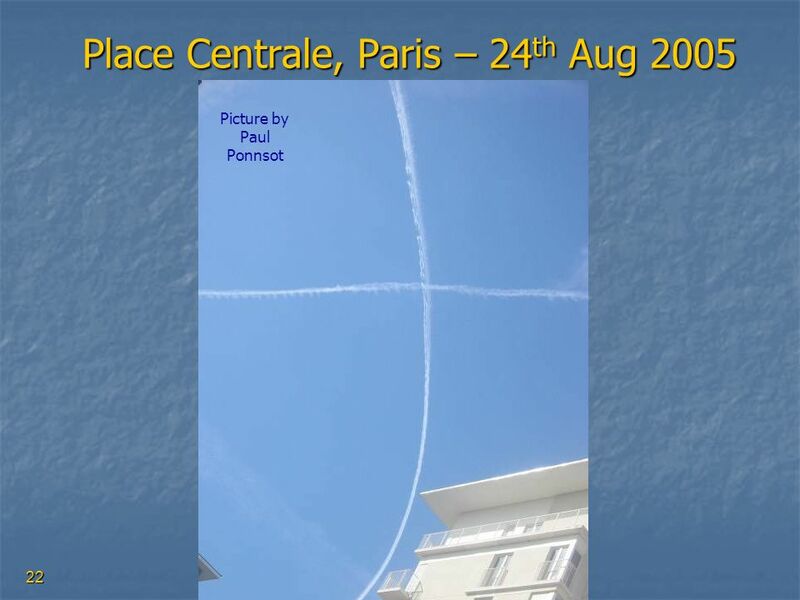 Purpose is unknown – though could be for one or more of: Weather Modification Biowarfare Atmospheric Modification to change properties or introduce aerosols to suppress immunity, affect crop yield, reduce biodiversity Very little direct information available outside personal observation and the odd rumour Disinformation is actively being put out. Kerosene is classed as a “Hydrocarbon” – it mainly contains alkanes – which are made up of carbon (approximately 85%) and hydrogen (approximately 12%). There are some other compounds in kerosene which contain nitrogen and sulphur (approximately 1% or 2% each respectively). 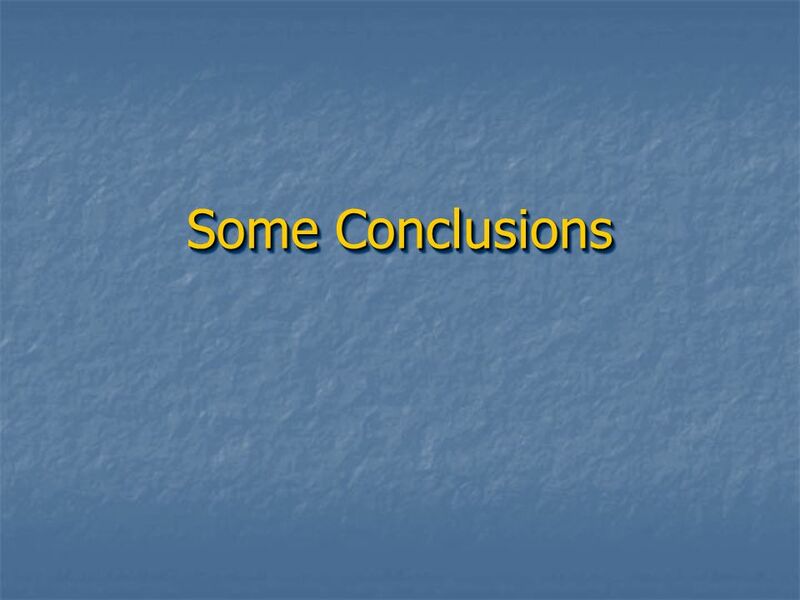 When Kerosene burns, therefore, it can only form compounds that contain elements that were originally in the Kerosene, or in the air it burns in. 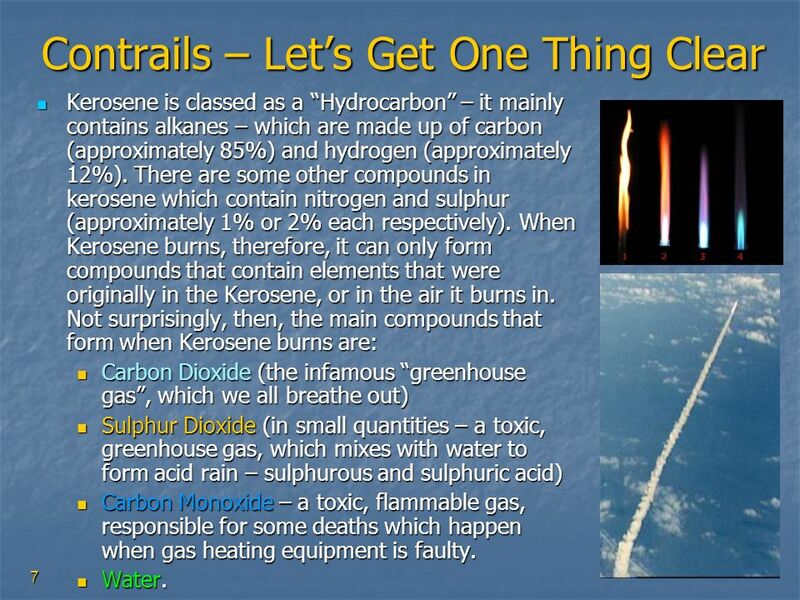 Not surprisingly, then, the main compounds that form when Kerosene burns are: Carbon Dioxide (the infamous “greenhouse gas”, which we all breathe out) Sulphur Dioxide (in small quantities – a toxic, greenhouse gas, which mixes with water to form acid rain – sulphurous and sulphuric acid) Carbon Monoxide – a toxic, flammable gas, responsible for some deaths which happen when gas heating equipment is faulty. Water. When we look at each of these compounds in turn, we find that they are all colourless. 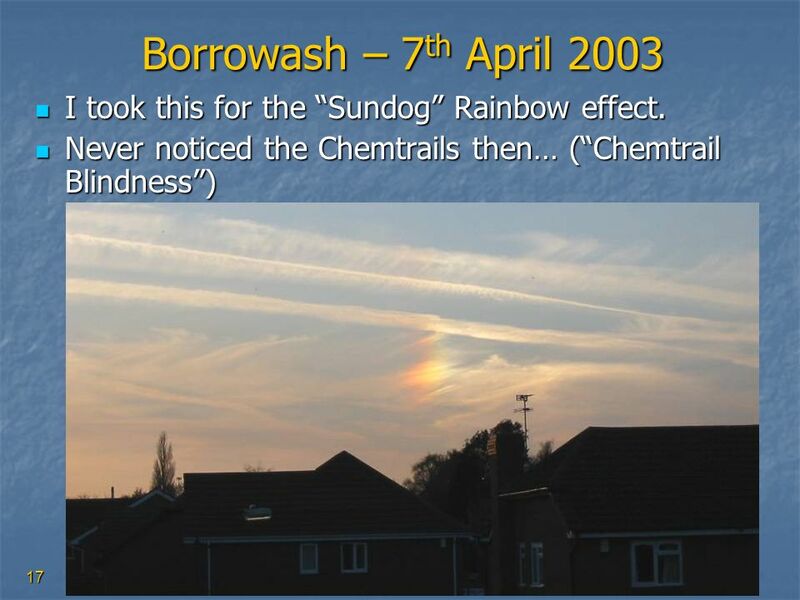 So, when kerosene burns, it would seem that the only visible thing we should see in the sky is the condensation – which, like our breath on a cold day, should disappear in a few tens-of-seconds. 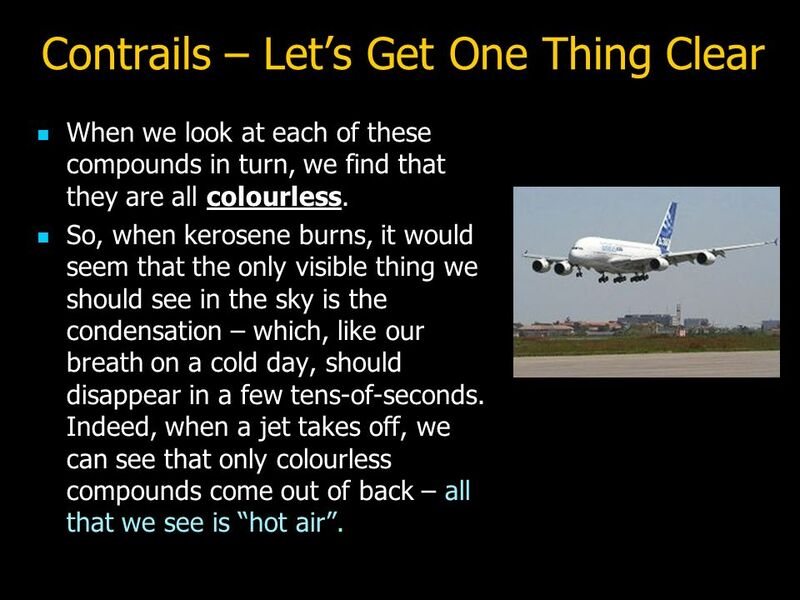 Indeed, when a jet takes off, we can see that only colourless compounds come out of back – all that we see is “hot air”. 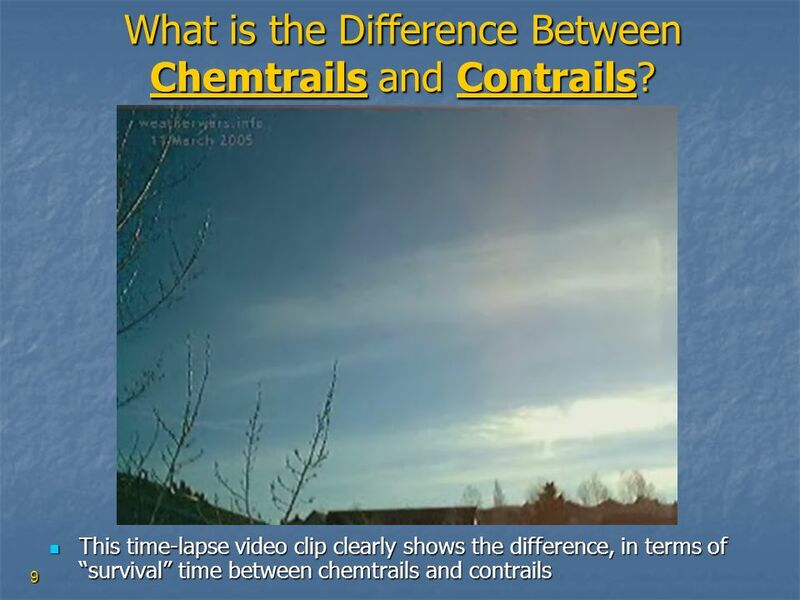 9 What is the Difference Between Chemtrails and Contrails? 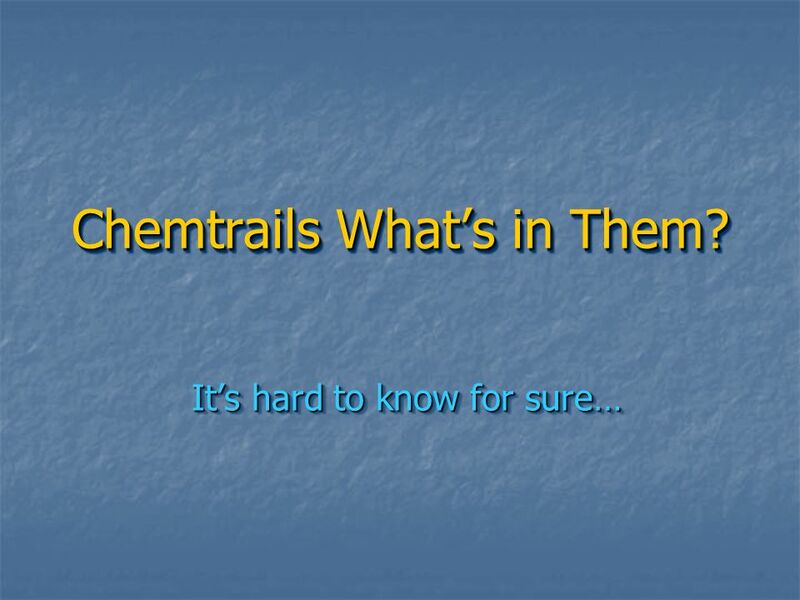 10 Chemtrails are Just Contrails! 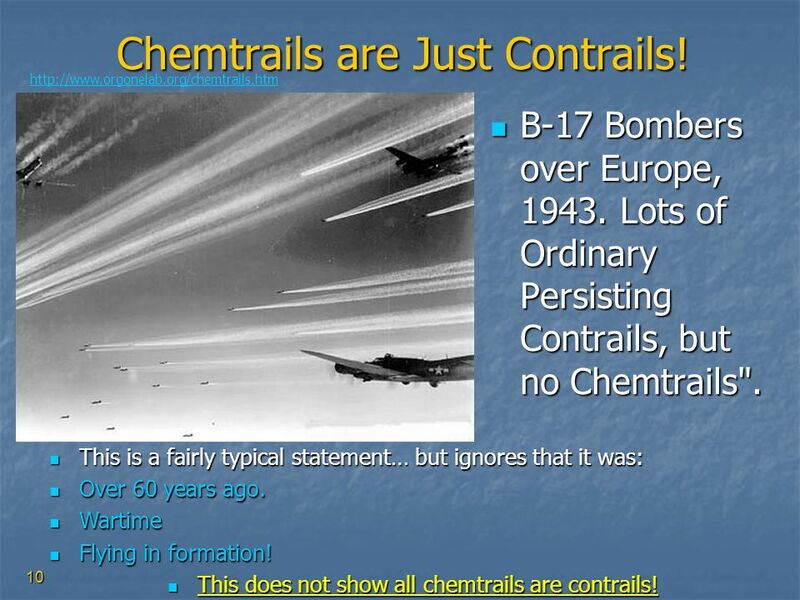 B-17 Bombers over Europe, Lots of Ordinary Persisting Contrails, but no Chemtrails". This is a fairly typical statement… but ignores that it was: Over 60 years ago. Wartime Flying in formation! 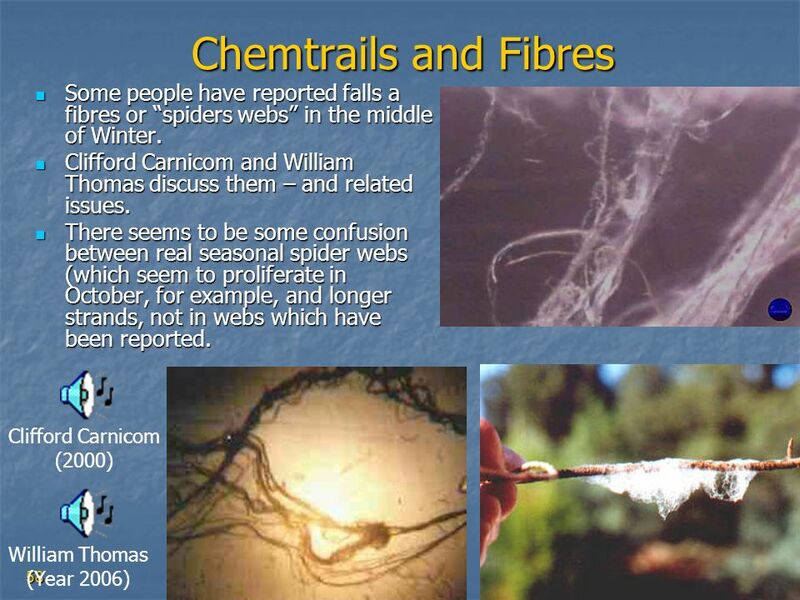 This does not show all chemtrails are contrails! 11 Some of these have been sent to me from around the UK and World. 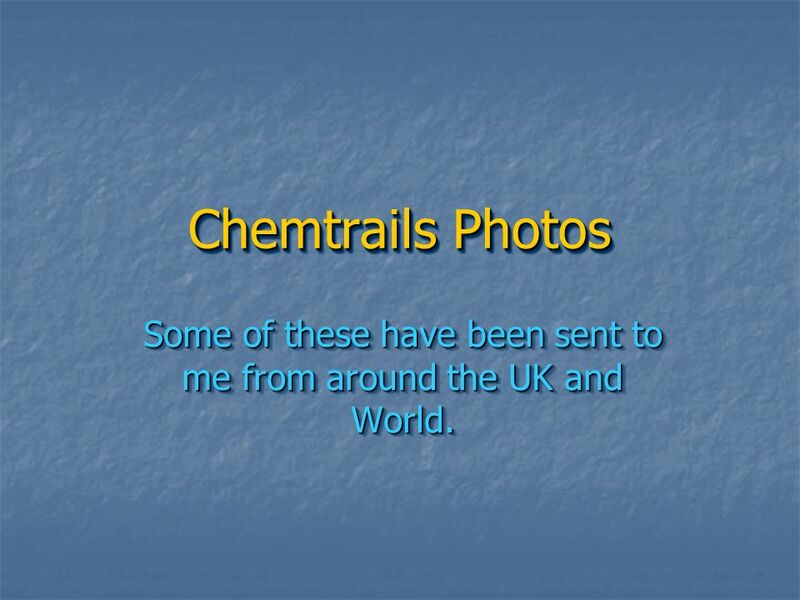 Chemtrails Photos Some of these have been sent to me from around the UK and World. 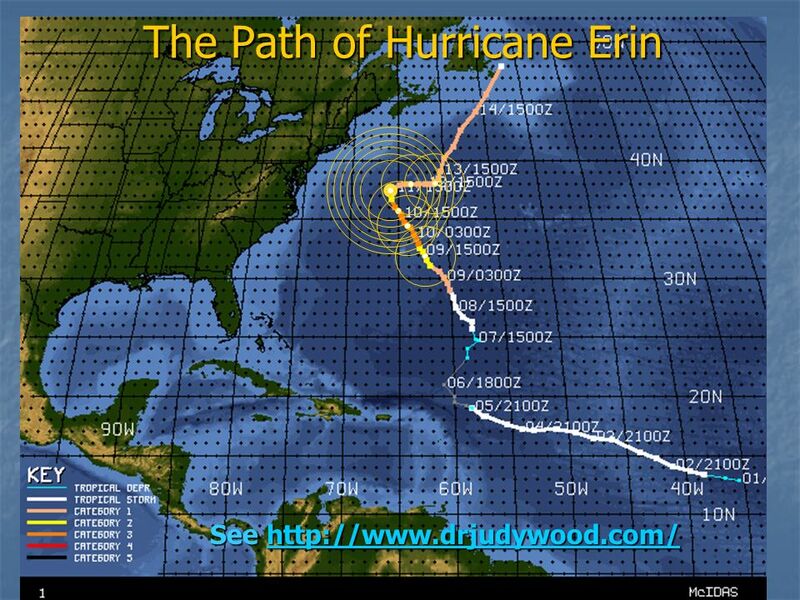 Note the “grid” pattern. 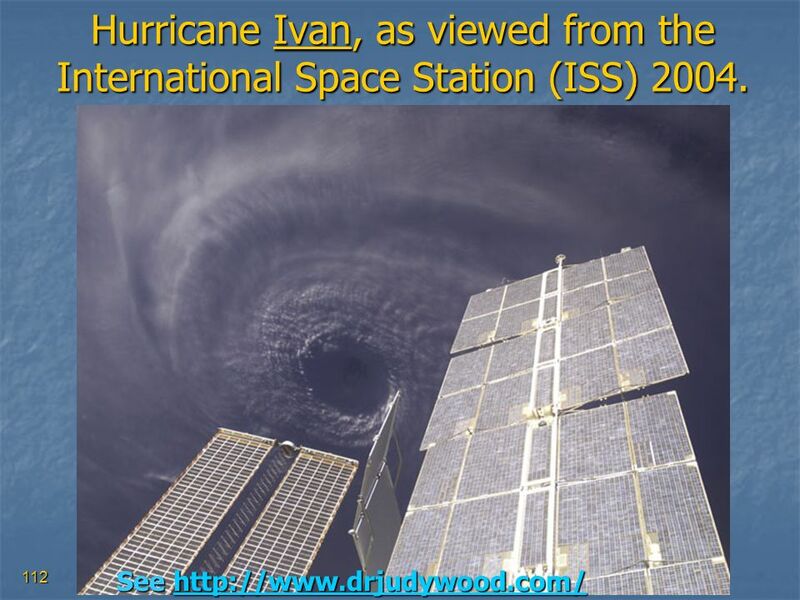 Also, bear in mind that this picture was taken at a minimum altitude of 150 miles (250km), AND from an angle. 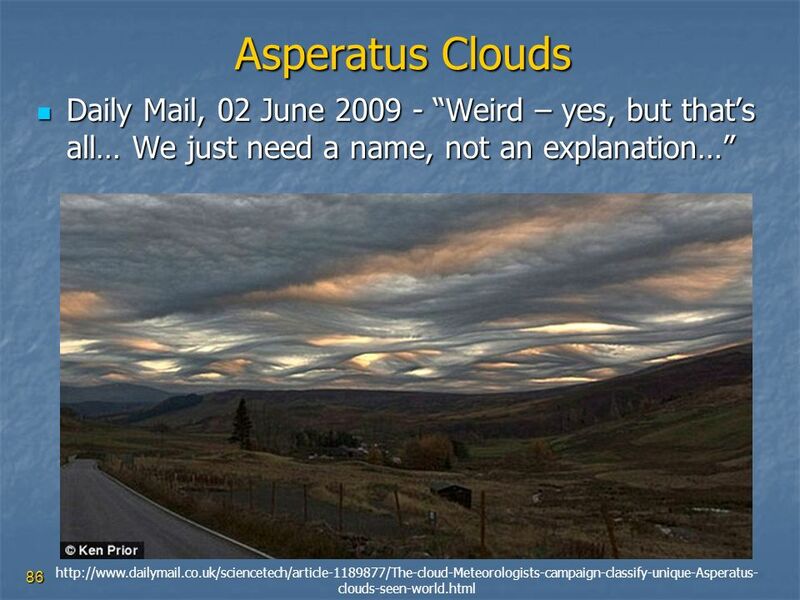 We are looking at an atmospheric phenomenon, which is at least 300 miles (500km) from the lens! 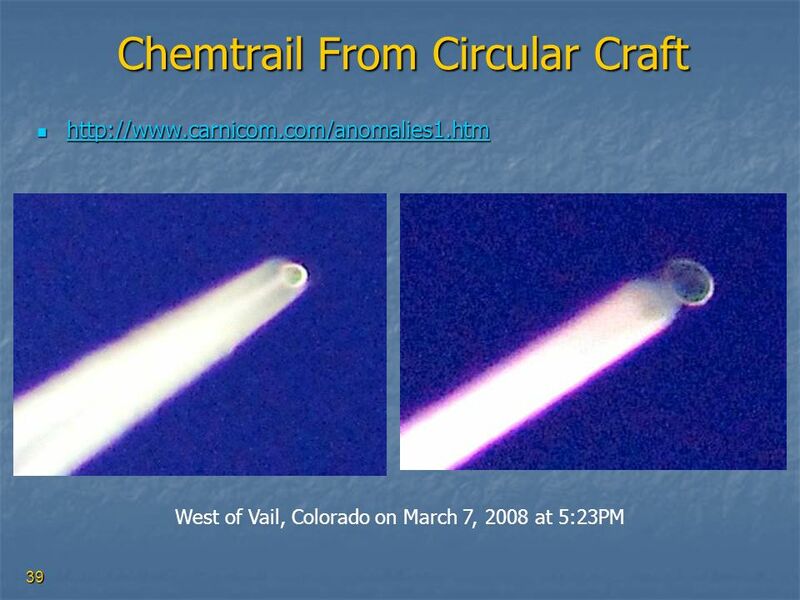 Ordinary, normal contrails could not, and would not, be visible from such a distance. 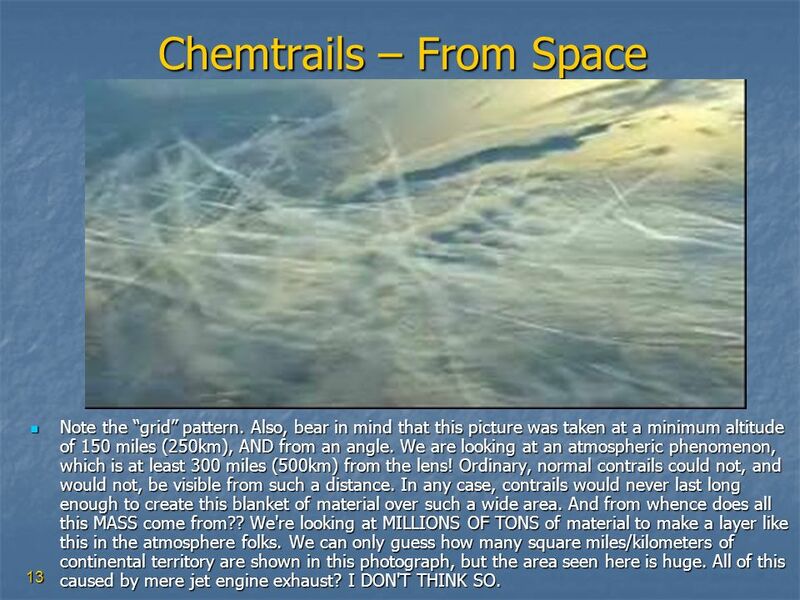 In any case, contrails would never last long enough to create this blanket of material over such a wide area. 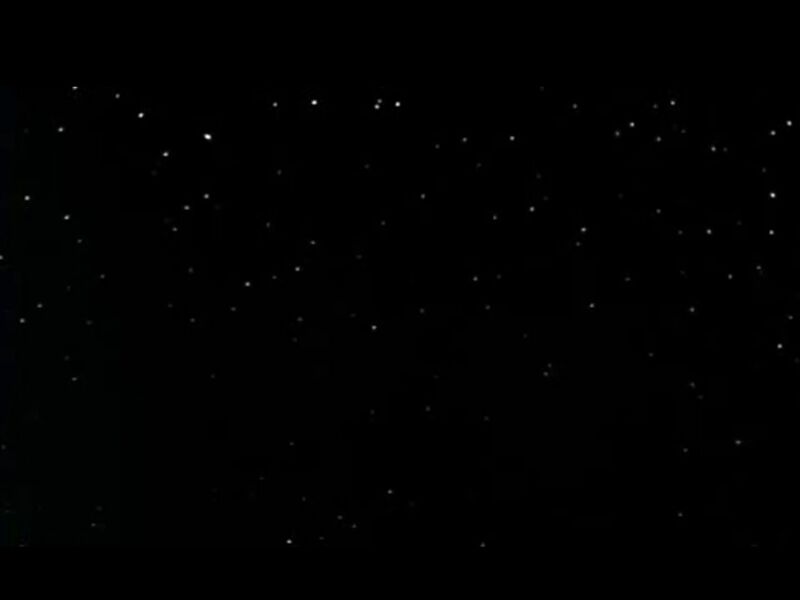 And from whence does all this MASS come from?? 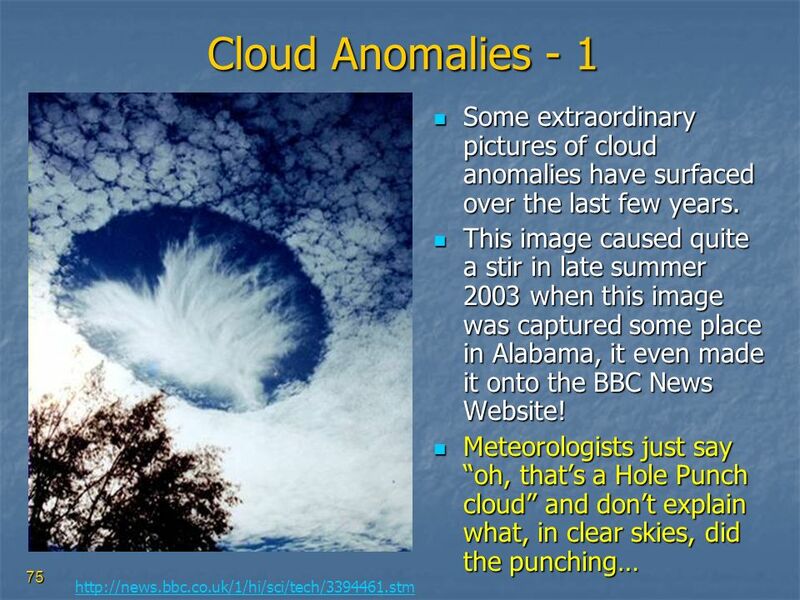 We're looking at MILLIONS OF TONS of material to make a layer like this in the atmosphere folks. We can only guess how many square miles/kilometers of continental territory are shown in this photograph, but the area seen here is huge. 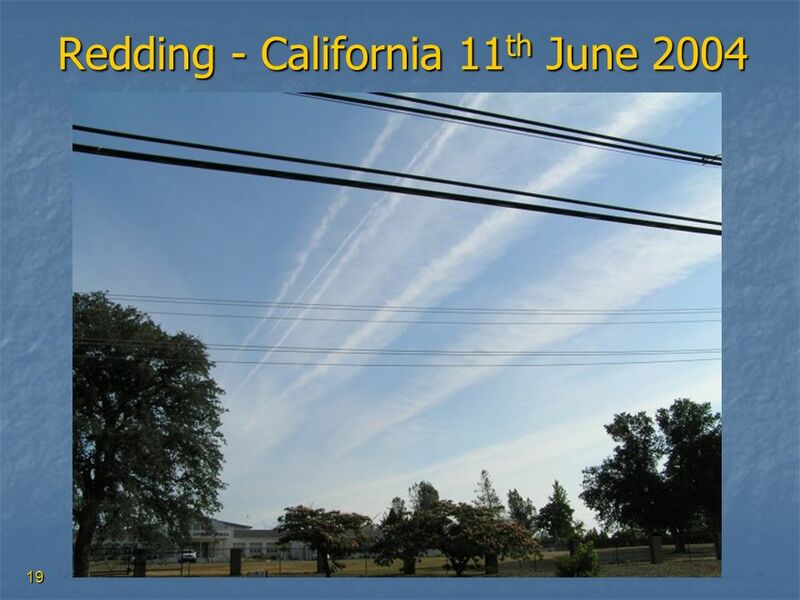 All of this caused by mere jet engine exhaust? I DON'T THINK SO. 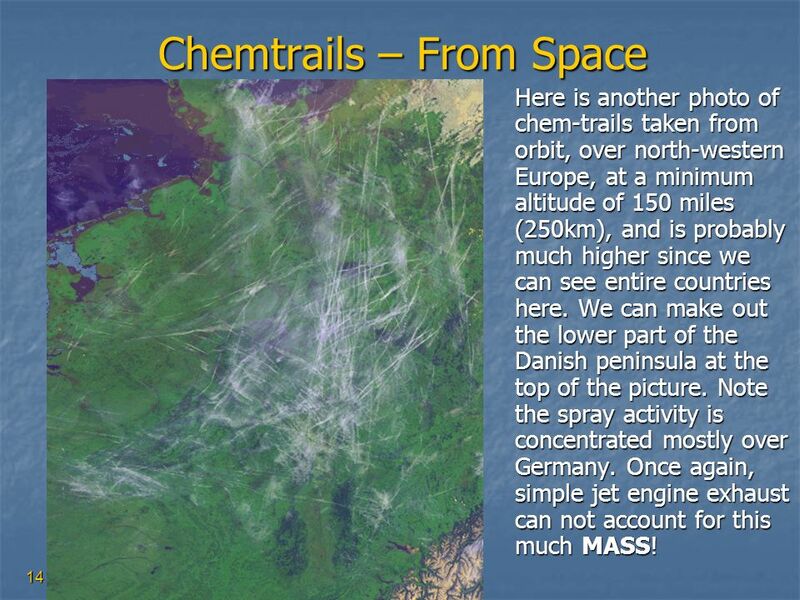 Here is another photo of chem-trails taken from orbit, over north-western Europe, at a minimum altitude of 150 miles (250km), and is probably much higher since we can see entire countries here. 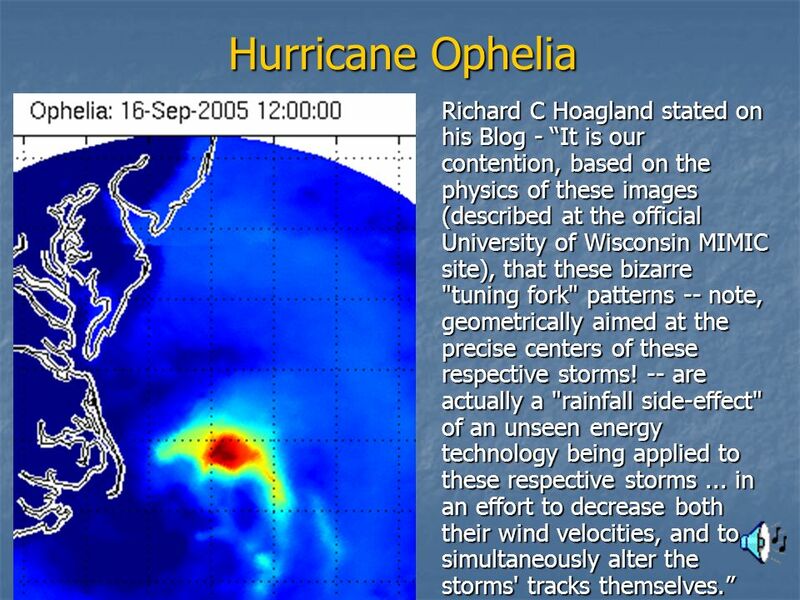 We can make out the lower part of the Danish peninsula at the top of the picture. 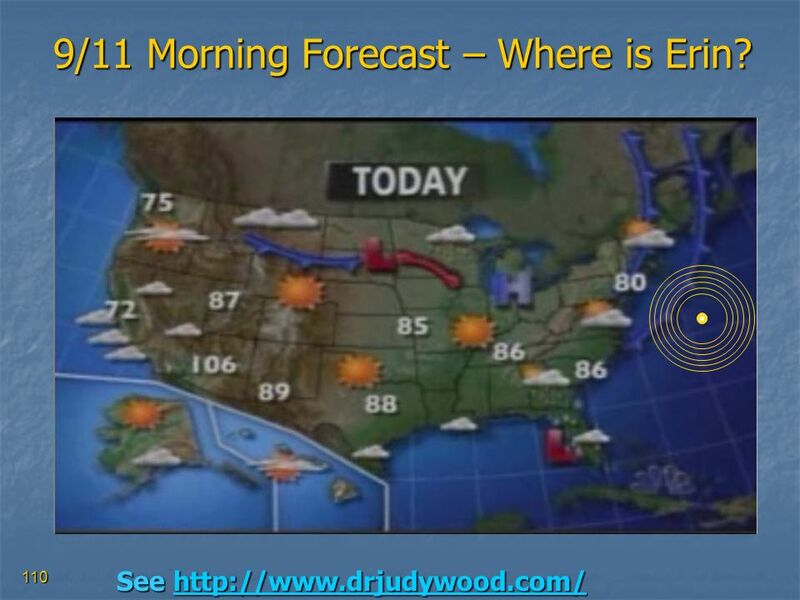 Note the spray activity is concentrated mostly over Germany. 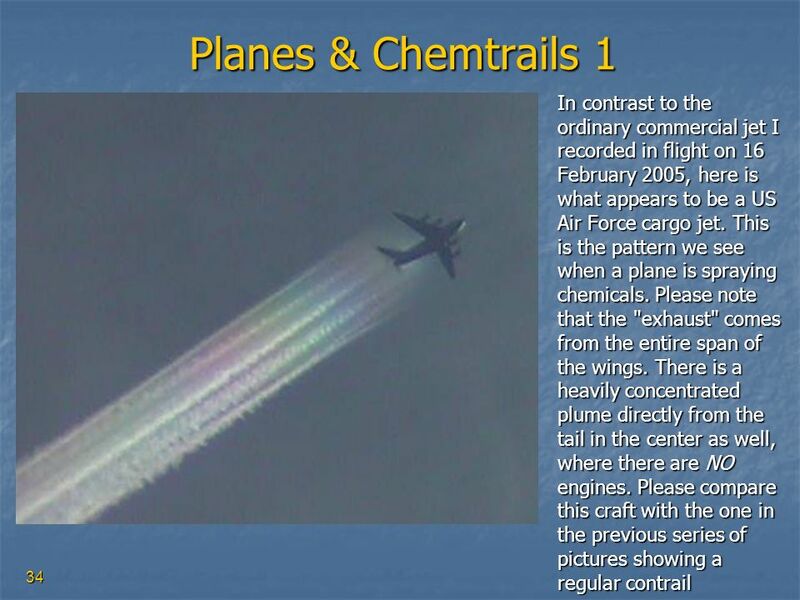 Once again, simple jet engine exhaust can not account for this much MASS! 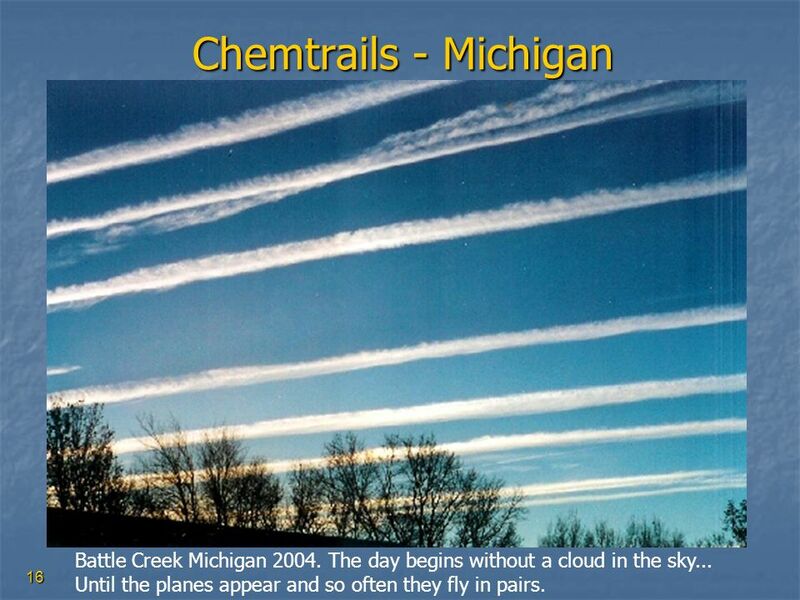 16 Chemtrails - Michigan Battle Creek Michigan The day begins without a cloud in the sky... Until the planes appear and so often they fly in pairs. 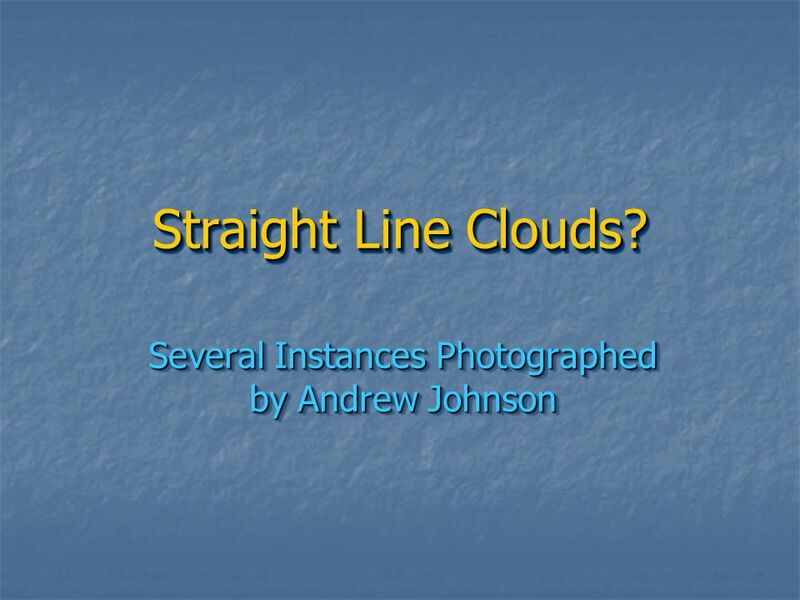 24 I can count at least 9 separate trails – several of them intersecting! 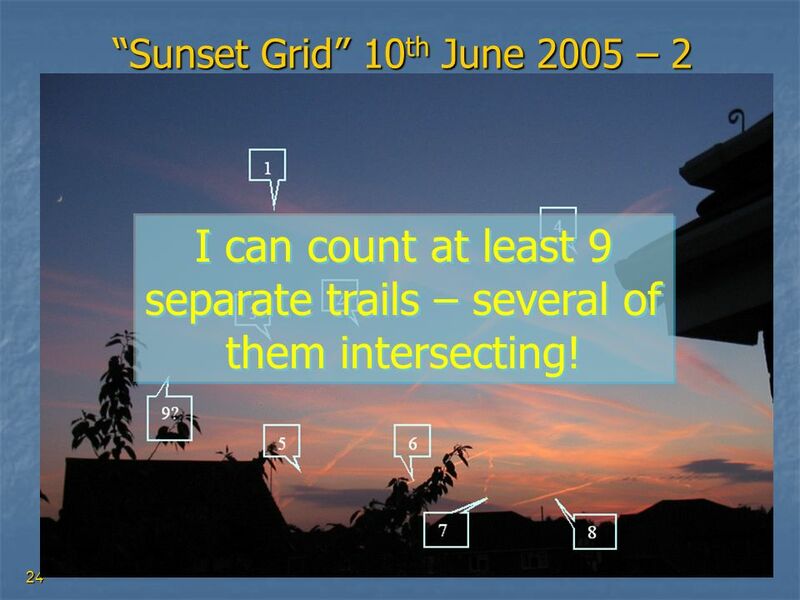 “Sunset Grid” 10th June 2005 – 2 I can count at least 9 separate trails – several of them intersecting! 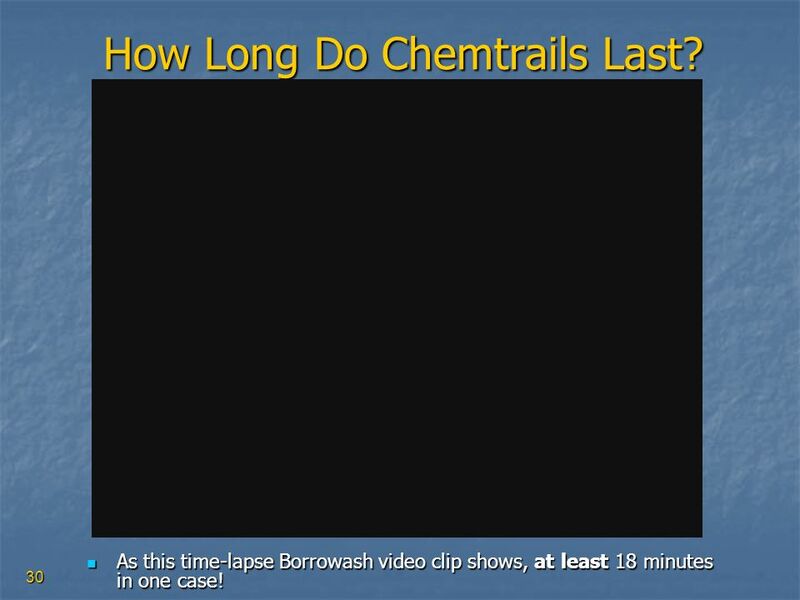 30 How Long Do Chemtrails Last? 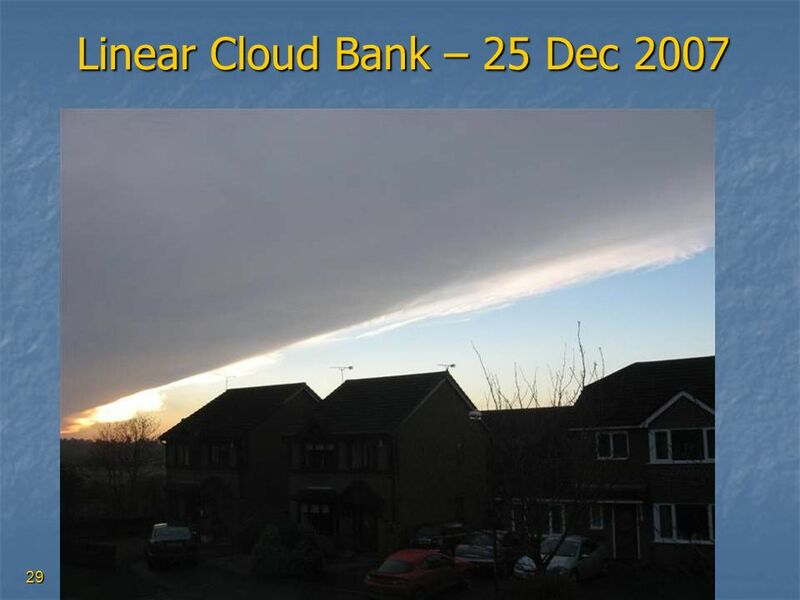 As this time-lapse Borrowash video clip shows, at least 18 minutes in one case! 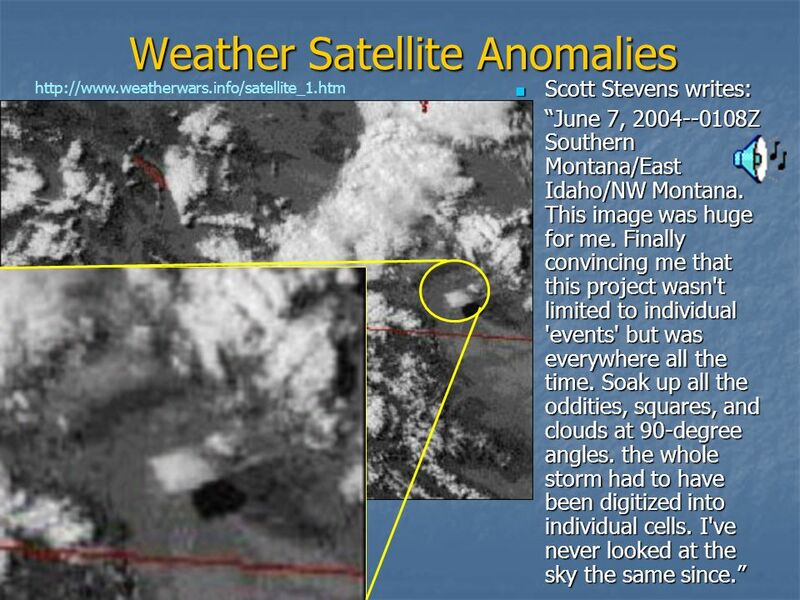 1 Visibility of Trails on Satellite Photos The mass of water vapour contained in a standard Contrail would be tiny, and certainly not observable from 150 miles up in space, and yet as Jeff Challender observes, we can see the trails on many satellite photographs. 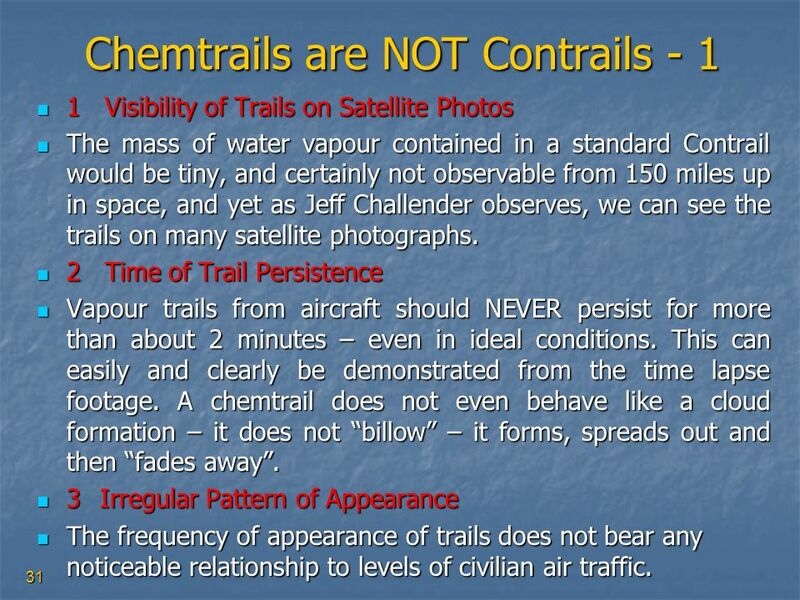 2 Time of Trail Persistence Vapour trails from aircraft should NEVER persist for more than about 2 minutes – even in ideal conditions. 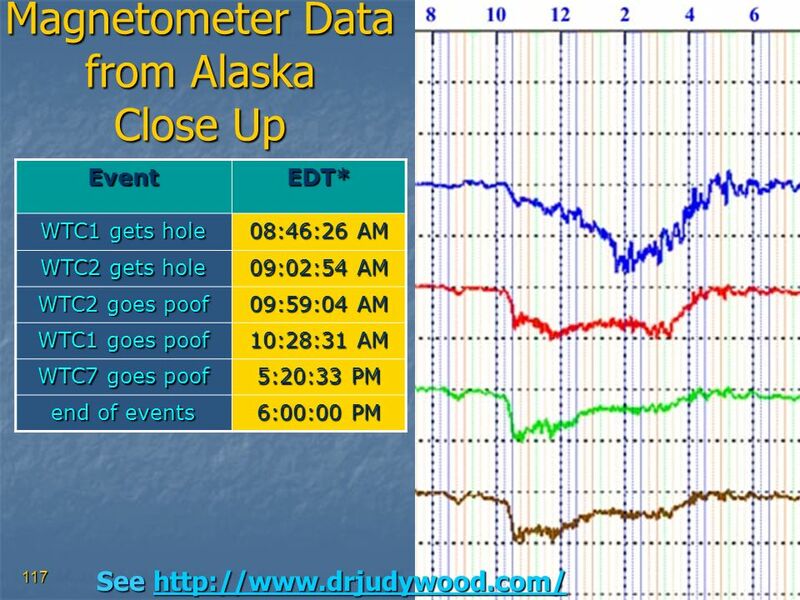 This can easily and clearly be demonstrated from the time lapse footage. 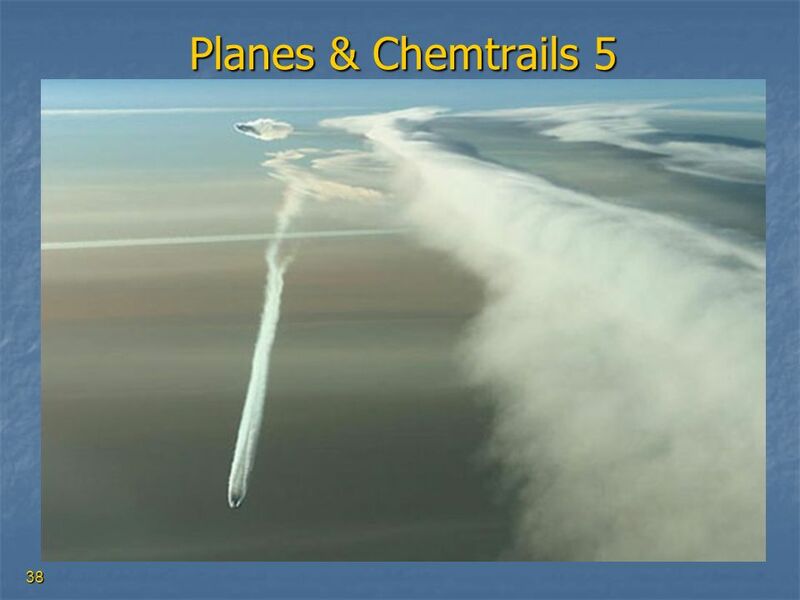 A chemtrail does not even behave like a cloud formation – it does not “billow” – it forms, spreads out and then “fades away”. 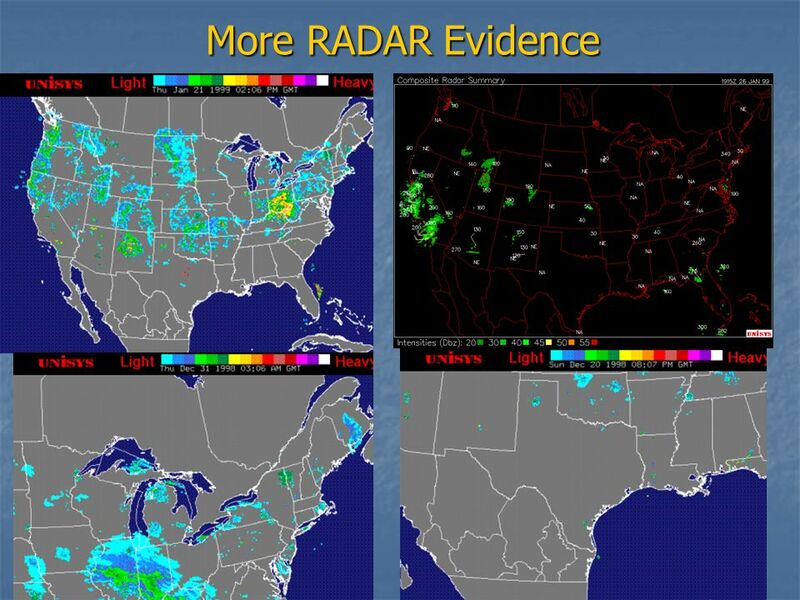 3 Irregular Pattern of Appearance The frequency of appearance of trails does not bear any noticeable relationship to levels of civilian air traffic. 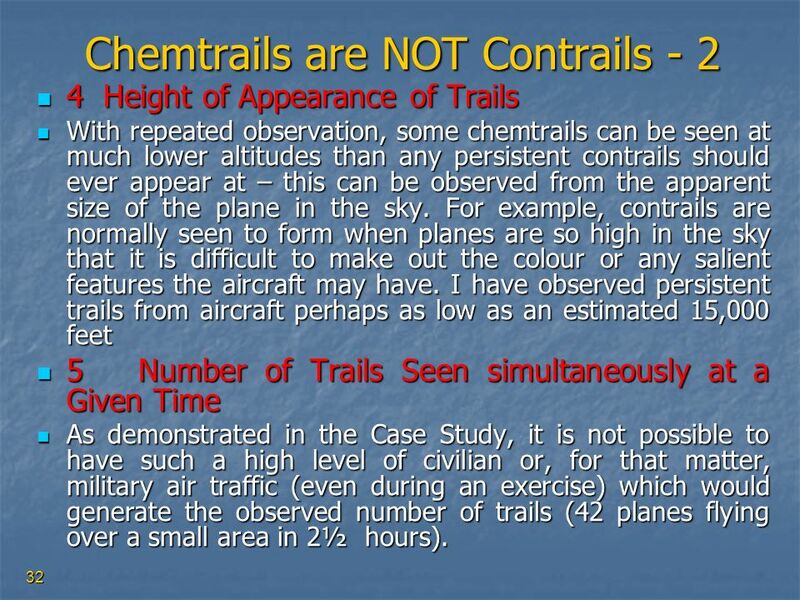 4 Height of Appearance of Trails With repeated observation, some chemtrails can be seen at much lower altitudes than any persistent contrails should ever appear at – this can be observed from the apparent size of the plane in the sky. 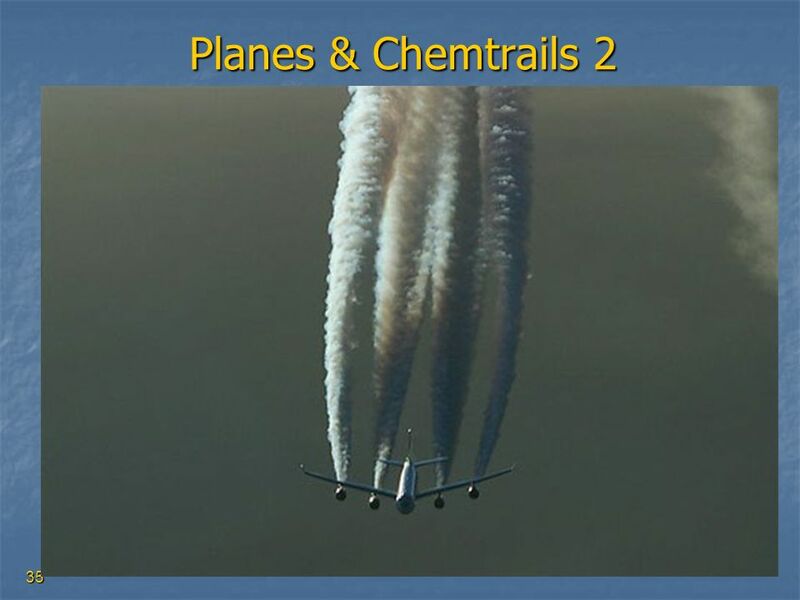 For example, contrails are normally seen to form when planes are so high in the sky that it is difficult to make out the colour or any salient features the aircraft may have. 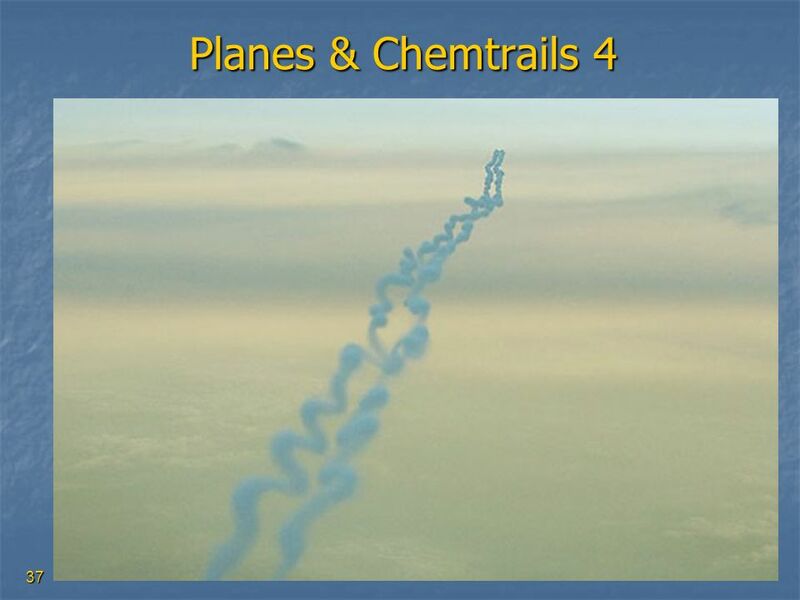 I have observed persistent trails from aircraft perhaps as low as an estimated 15,000 feet 5 Number of Trails Seen simultaneously at a Given Time As demonstrated in the Case Study, it is not possible to have such a high level of civilian or, for that matter, military air traffic (even during an exercise) which would generate the observed number of trails (42 planes flying over a small area in 2½ hours). 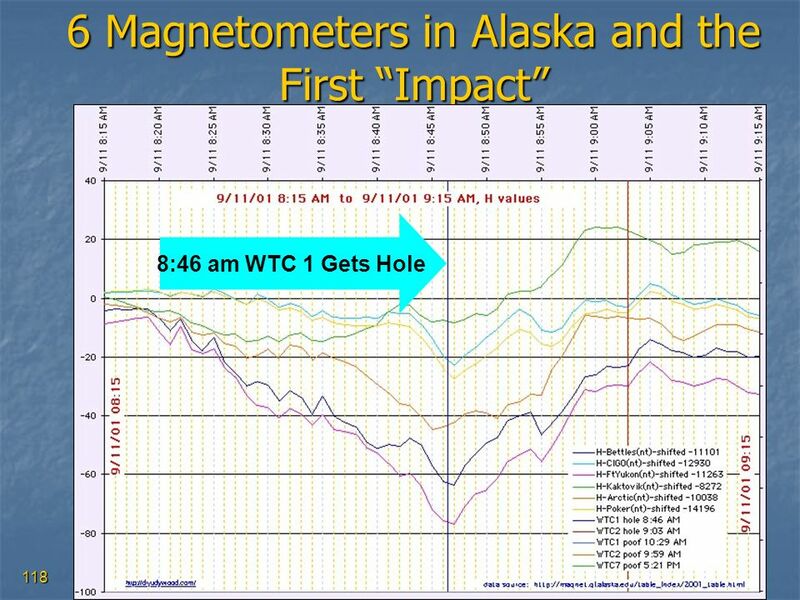 6 “Broken” Trails In many cases, instances of “broken” trails are seen – and these “breaks” are also persistent. 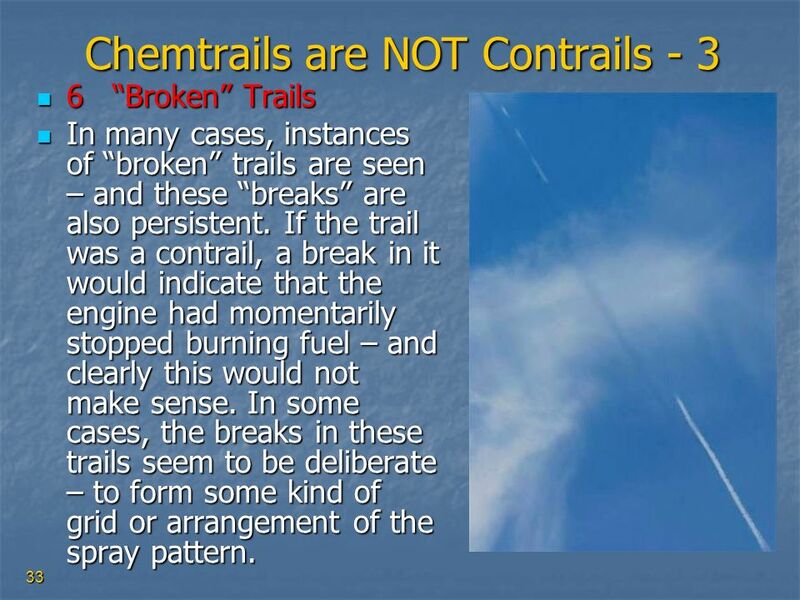 If the trail was a contrail, a break in it would indicate that the engine had momentarily stopped burning fuel – and clearly this would not make sense. 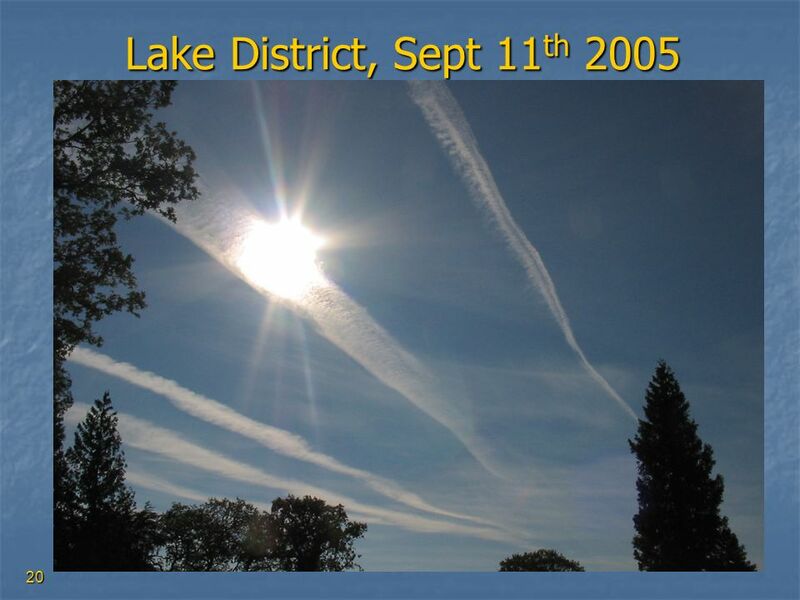 In some cases, the breaks in these trails seem to be deliberate – to form some kind of grid or arrangement of the spray pattern. 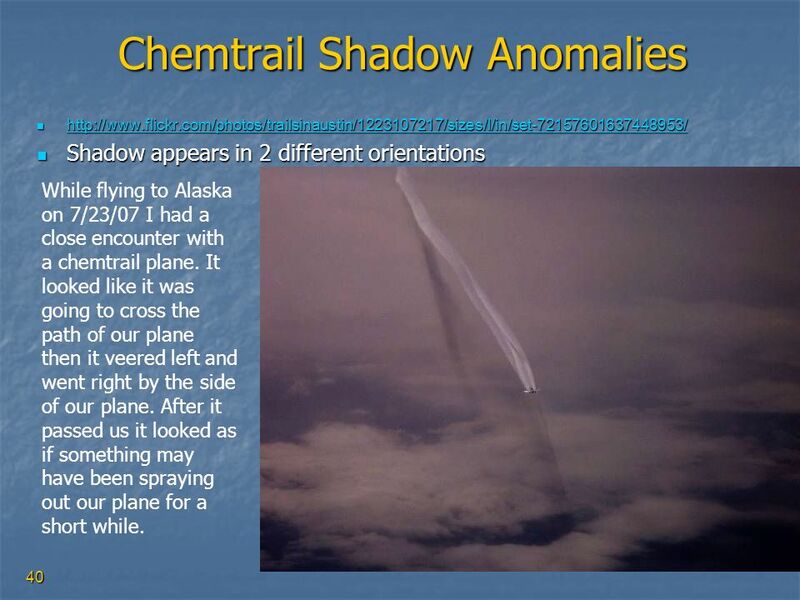 Shadow appears in 2 different orientations While flying to Alaska on 7/23/07 I had a close encounter with a chemtrail plane. It looked like it was going to cross the path of our plane then it veered left and went right by the side of our plane. After it passed us it looked as if something may have been spraying out our plane for a short while. 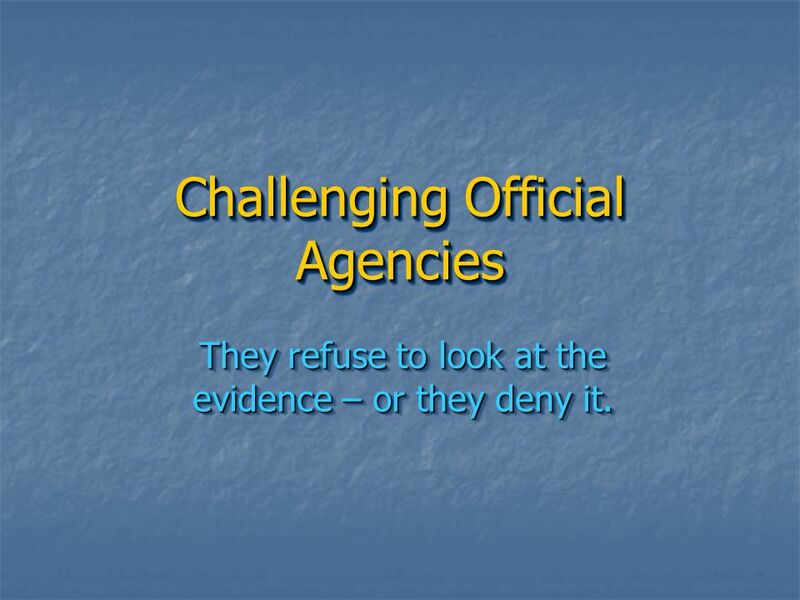 They refuse to look at the evidence – or they deny it. 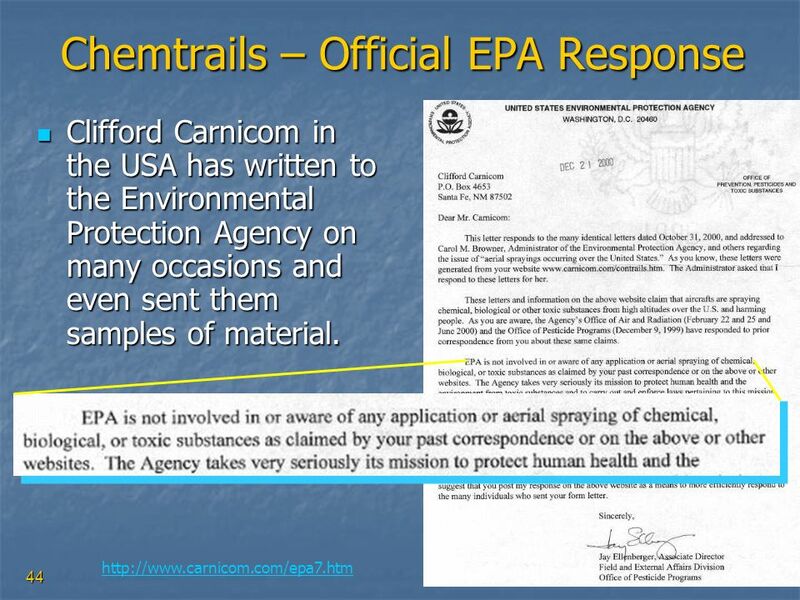 Clifford Carnicom in the USA has written to the Environmental Protection Agency on many occasions and even sent them samples of material. 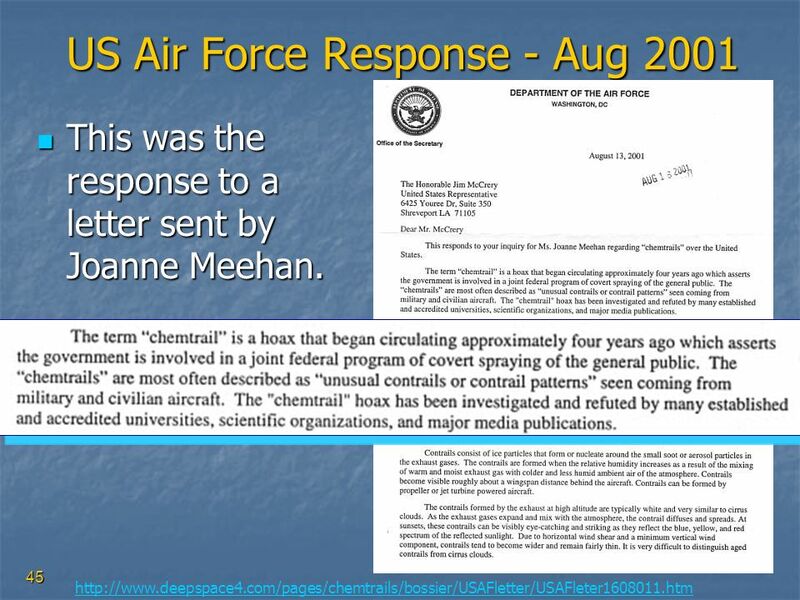 This was the response to a letter sent by Joanne Meehan. 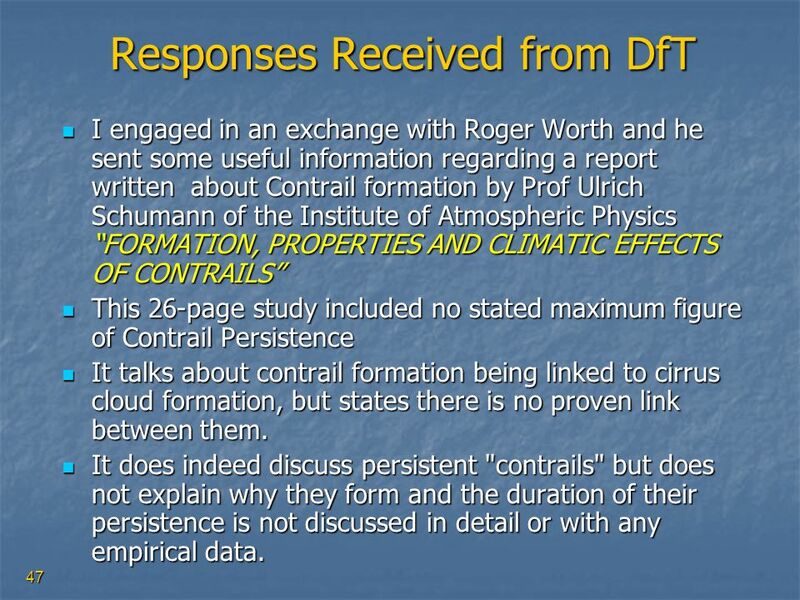 I engaged in an exchange with Roger Worth and he sent some useful information regarding a report written about Contrail formation by Prof Ulrich Schumann of the Institute of Atmospheric Physics “FORMATION, PROPERTIES AND CLIMATIC EFFECTS OF CONTRAILS” This 26-page study included no stated maximum figure of Contrail Persistence It talks about contrail formation being linked to cirrus cloud formation, but states there is no proven link between them. 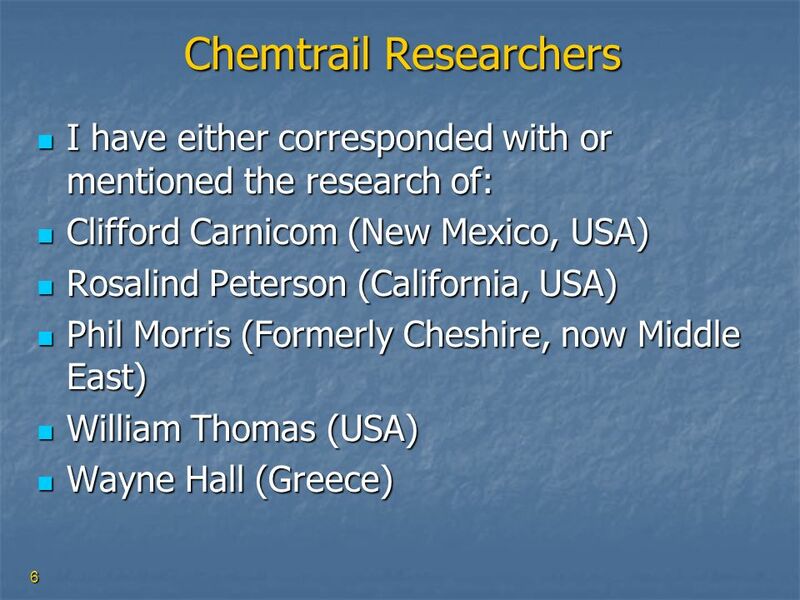 It does indeed discuss persistent "contrails" but does not explain why they form and the duration of their persistence is not discussed in detail or with any empirical data. 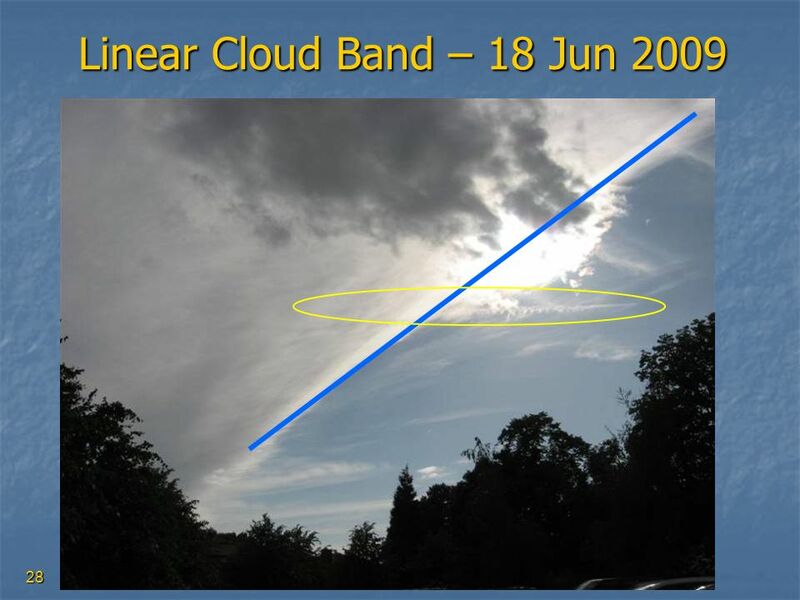 Mentions the standard contrail duration of maximum 2 minutes. 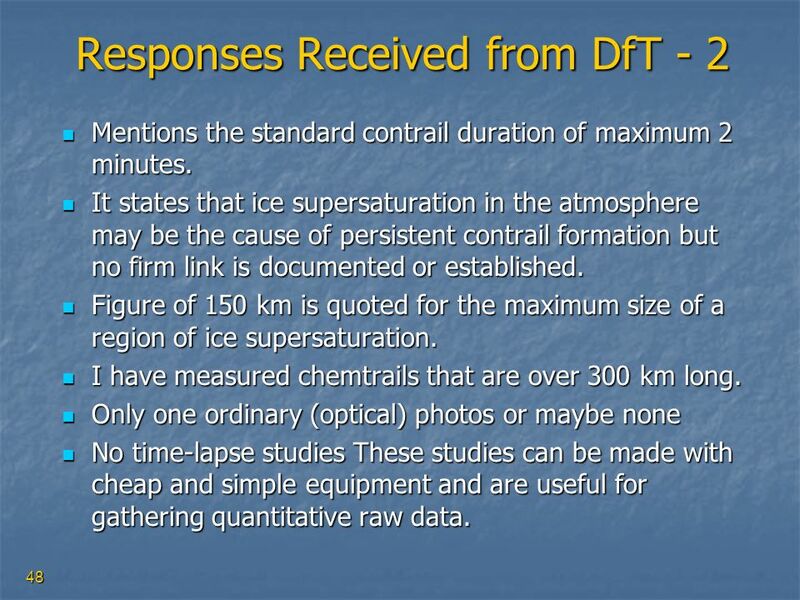 It states that ice supersaturation in the atmosphere may be the cause of persistent contrail formation but no firm link is documented or established. 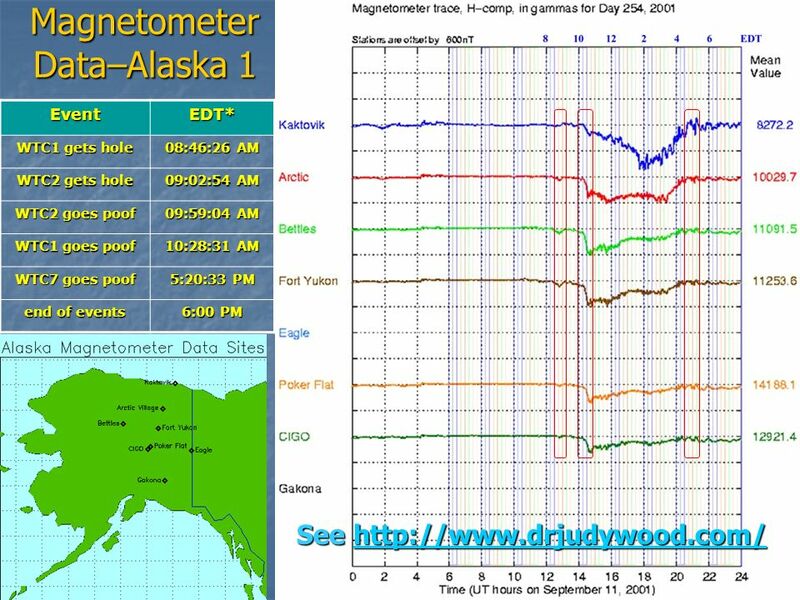 Figure of 150 km is quoted for the maximum size of a region of ice supersaturation. 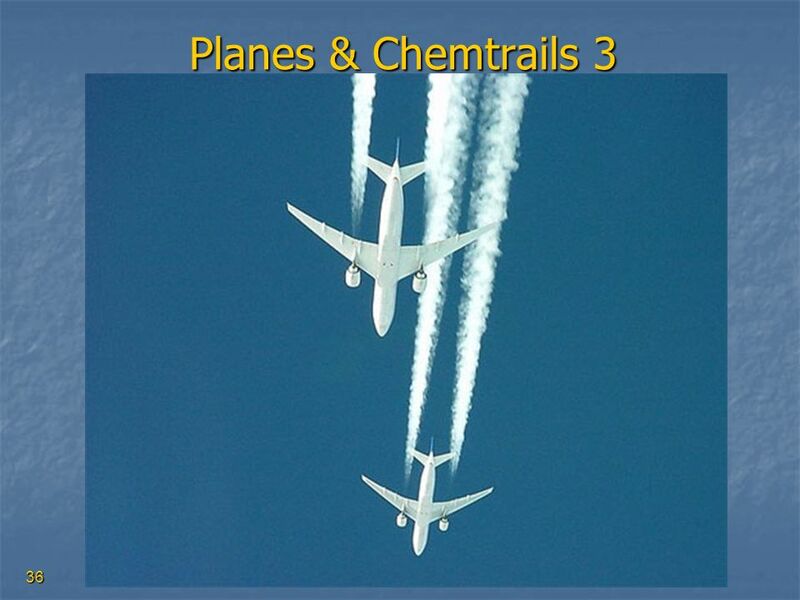 I have measured chemtrails that are over 300 km long. 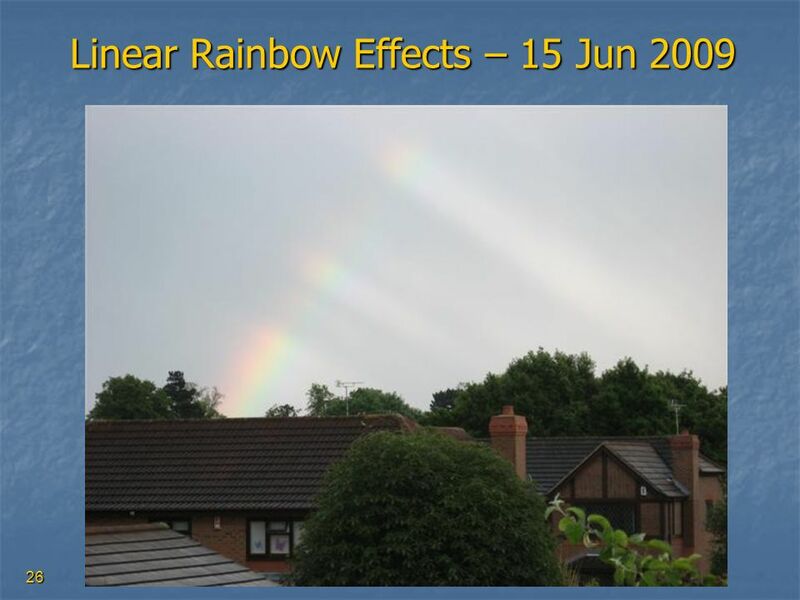 Only one ordinary (optical) photos or maybe none No time-lapse studies These studies can be made with cheap and simple equipment and are useful for gathering quantitative raw data. 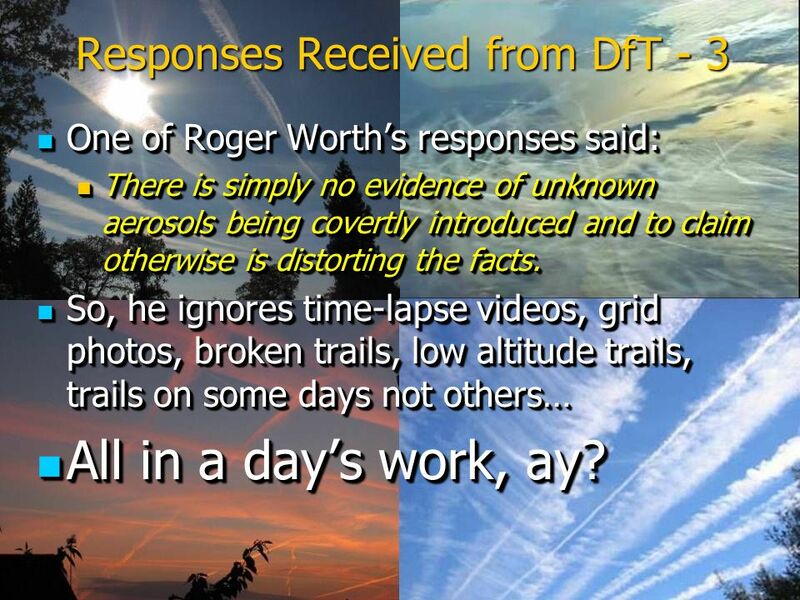 One of Roger Worth’s responses said: There is simply no evidence of unknown aerosols being covertly introduced and to claim otherwise is distorting the facts. So, he ignores time-lapse videos, grid photos, broken trails, low altitude trails, trails on some days not others… All in a day’s work, ay? 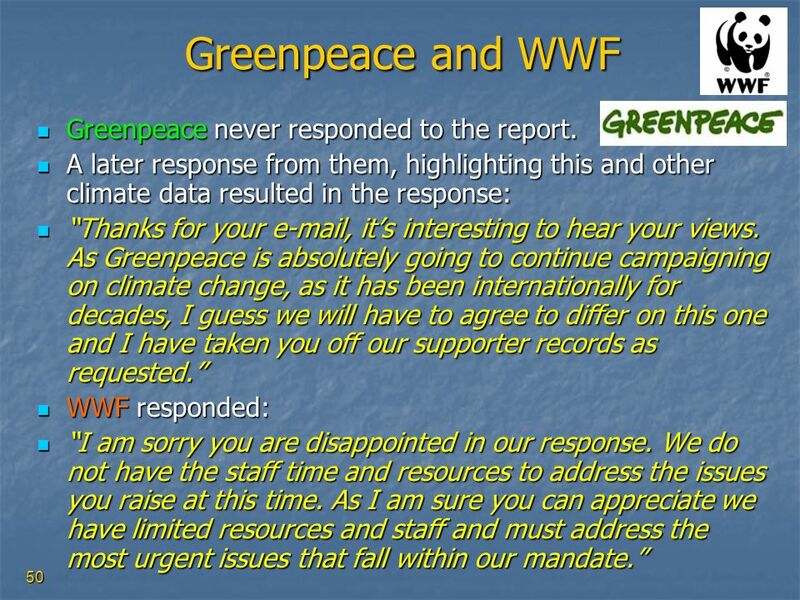 50 Greenpeace and WWF Greenpeace never responded to the report. 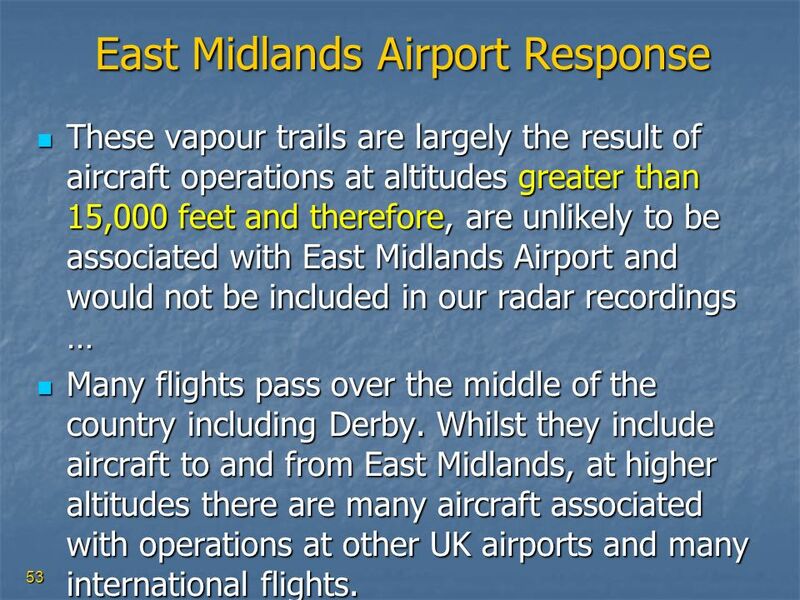 These vapour trails are largely the result of aircraft operations at altitudes greater than 15,000 feet and therefore, are unlikely to be associated with East Midlands Airport and would not be included in our radar recordings … Many flights pass over the middle of the country including Derby. 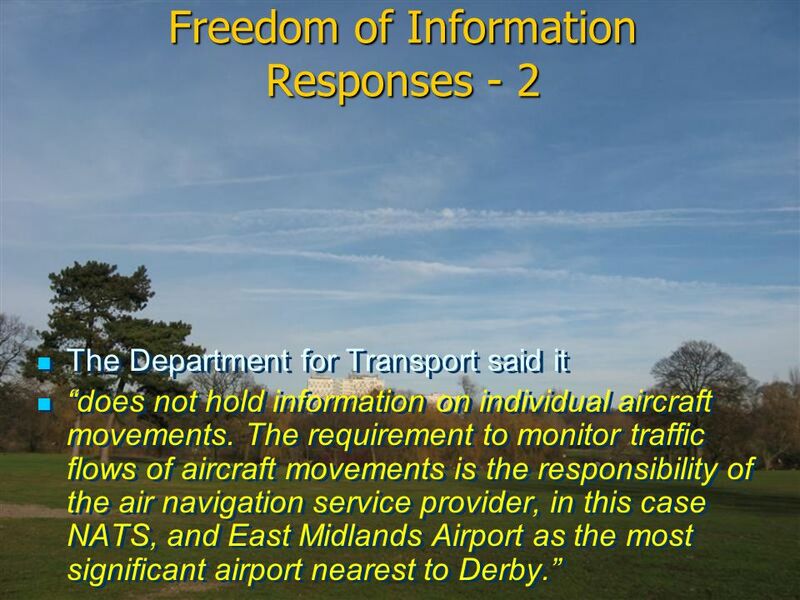 Whilst they include aircraft to and from East Midlands, at higher altitudes there are many aircraft associated with operations at other UK airports and many international flights. 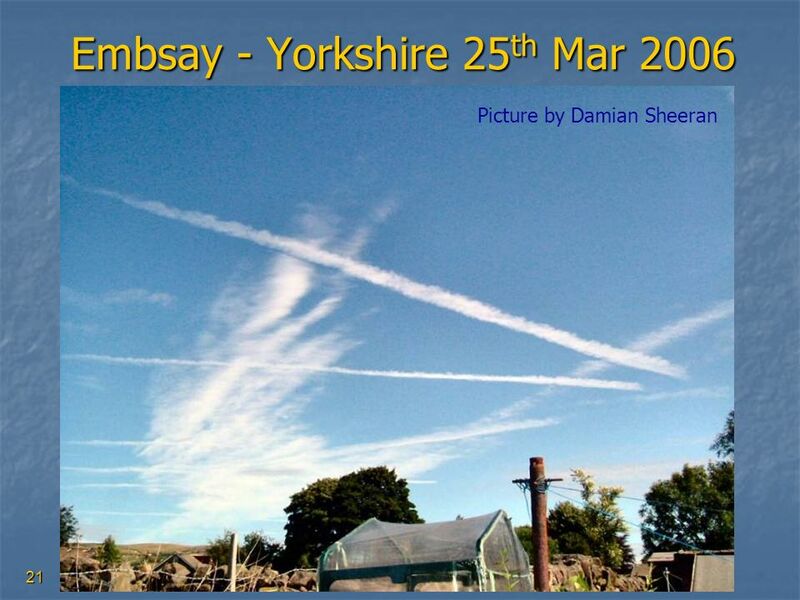 54 So, it’s All Contrails, Right? 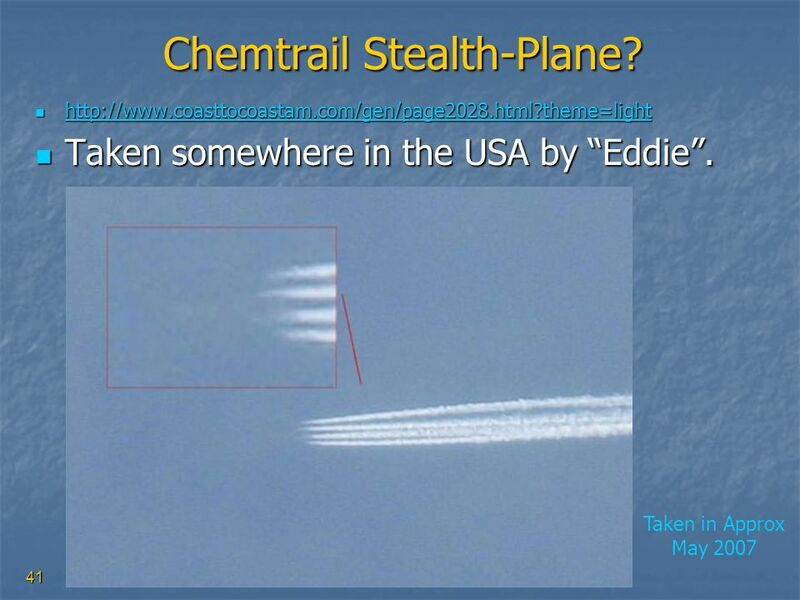 Several people have written to me (outside of the official responses) strongly insisting all I am seeing are CONTRAILS. 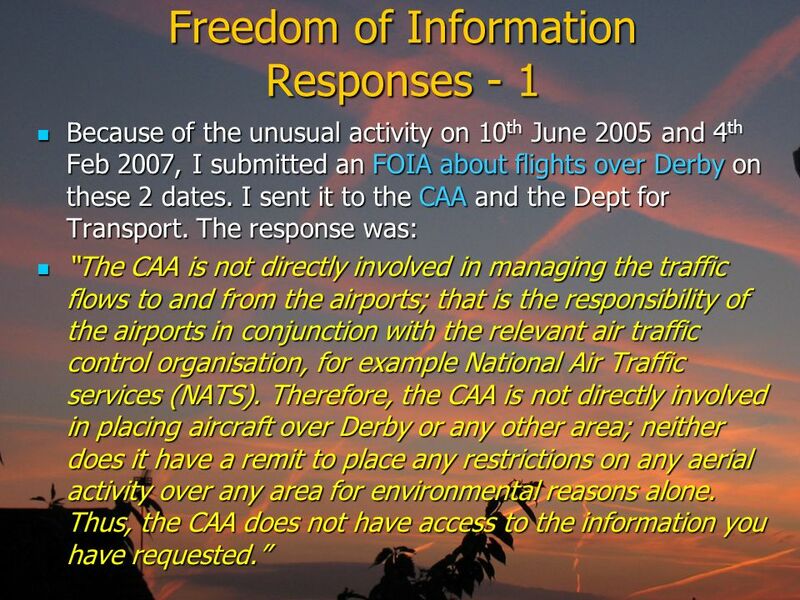 NONE them can give me the flight numbers or ANY information about the flights that came near my house on June 10th 2005 or flights that came over Derby on Feb 4th 2007. 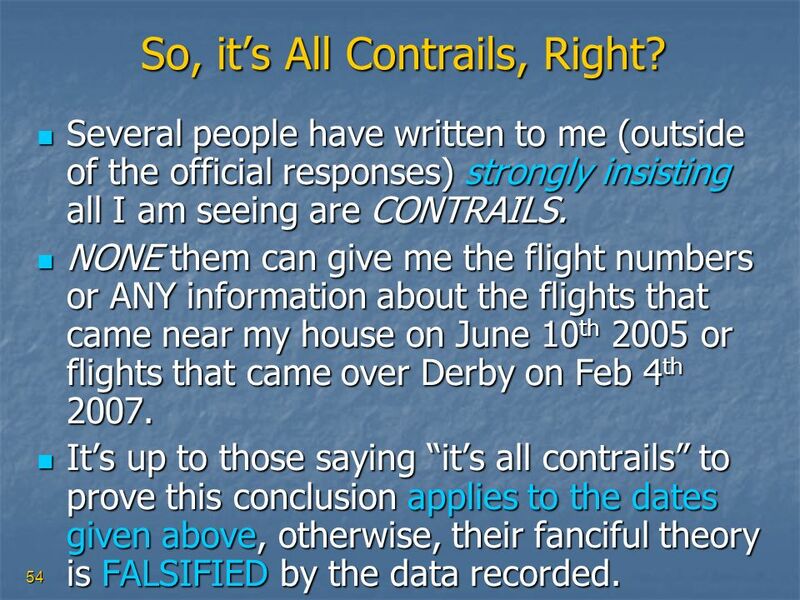 It’s up to those saying “it’s all contrails” to prove this conclusion applies to the dates given above, otherwise, their fanciful theory is FALSIFIED by the data recorded. 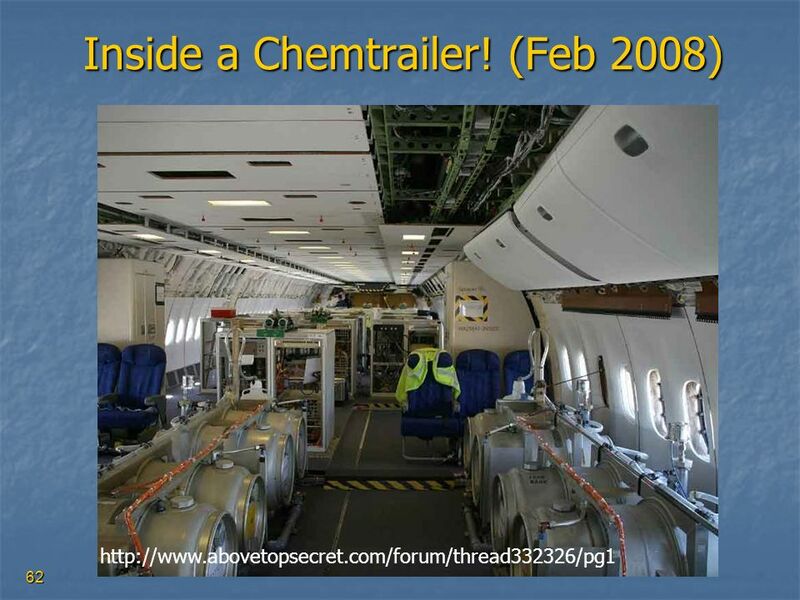 55 Chemtrails What’s in Them? 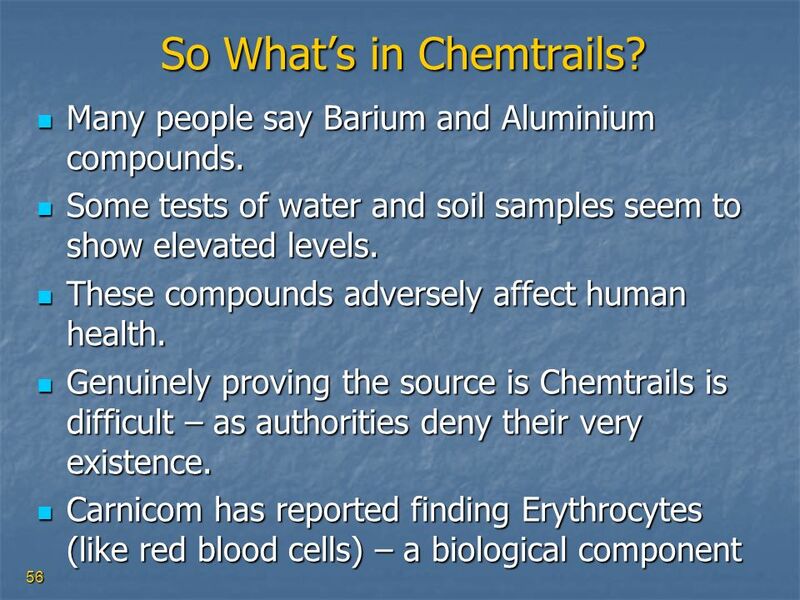 56 So What’s in Chemtrails? 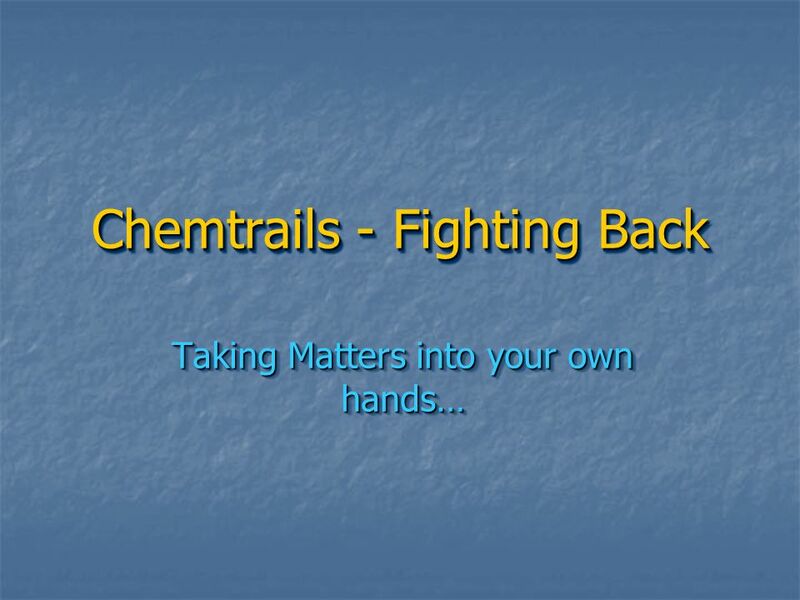 57 What are Chemtrails For? 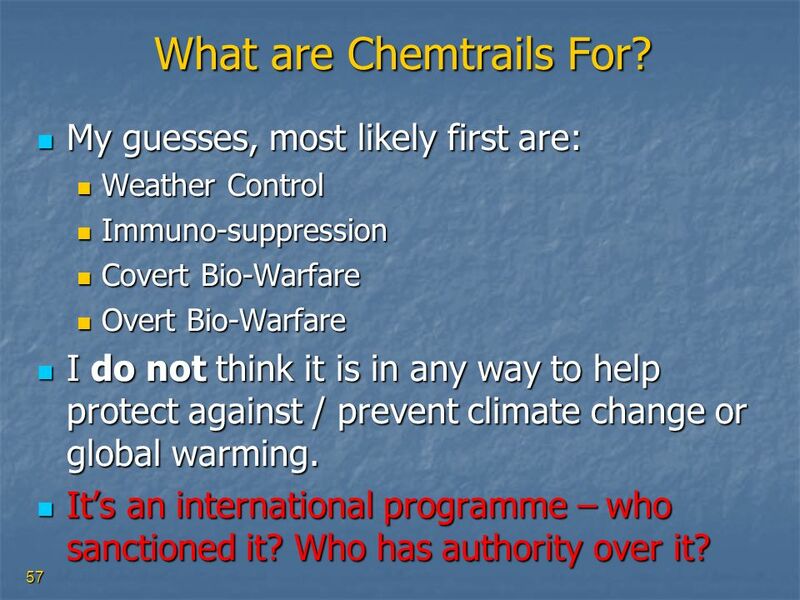 My guesses, most likely first are: Weather Control Immuno-suppression Covert Bio-Warfare Overt Bio-Warfare I do not think it is in any way to help protect against / prevent climate change or global warming. 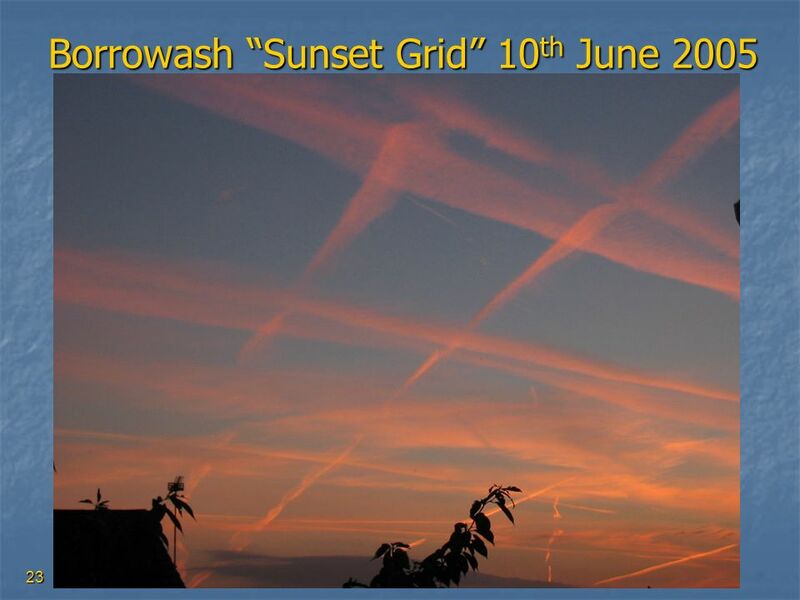 It’s an international programme – who sanctioned it? Who has authority over it? 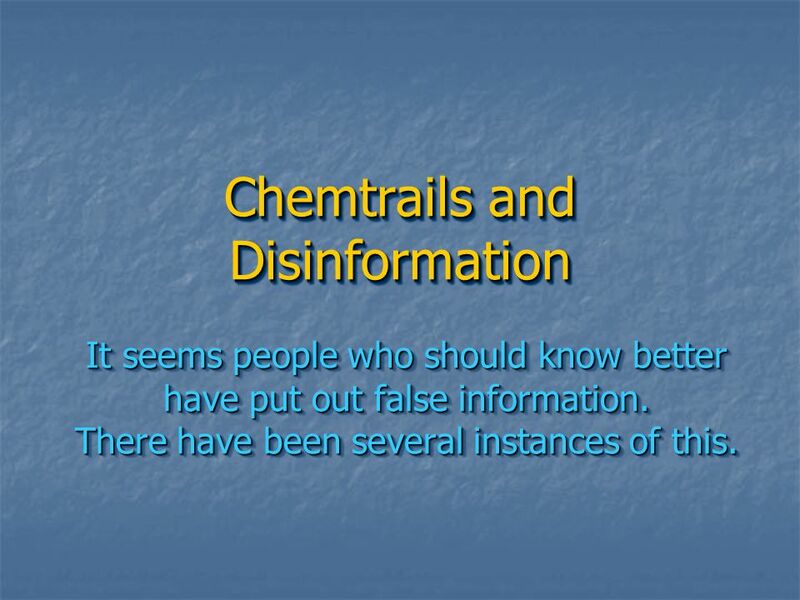 It seems people who should know better have put out false information. There have been several instances of this. 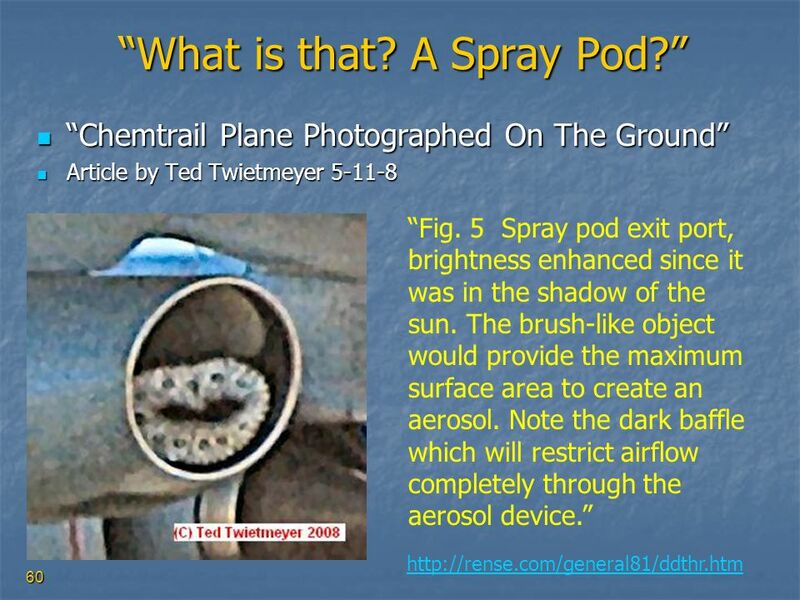 61 Not a “Spray Pod”!! Refuelling Pod!! 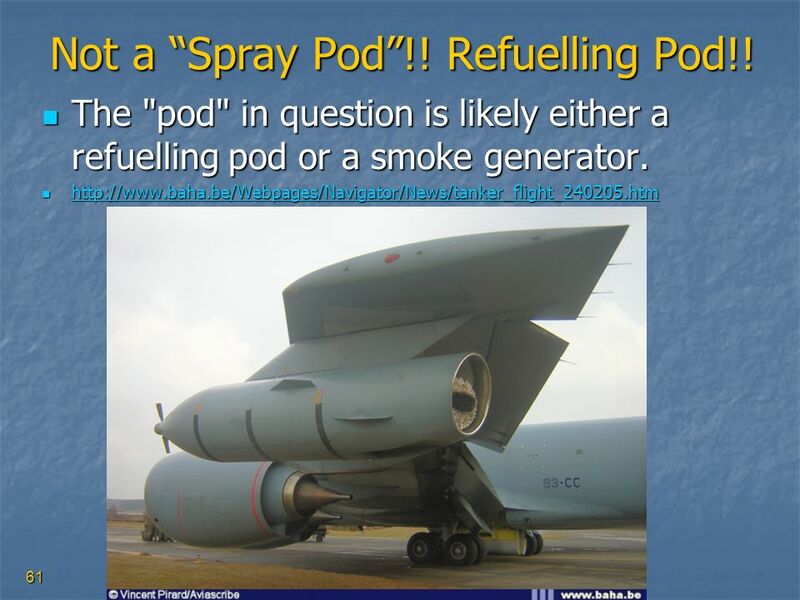 The "pod" in question is likely either a refuelling pod or a smoke generator. 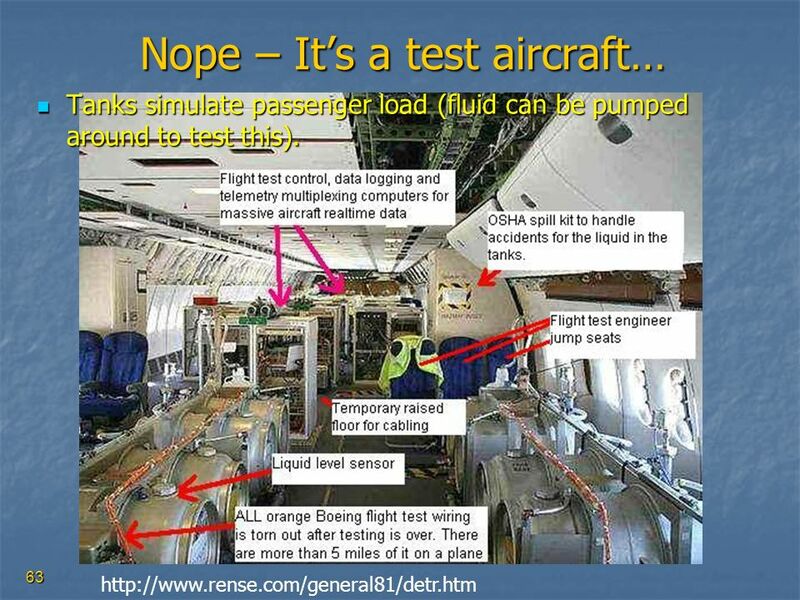 Tanks simulate passenger load (fluid can be pumped around to test this). 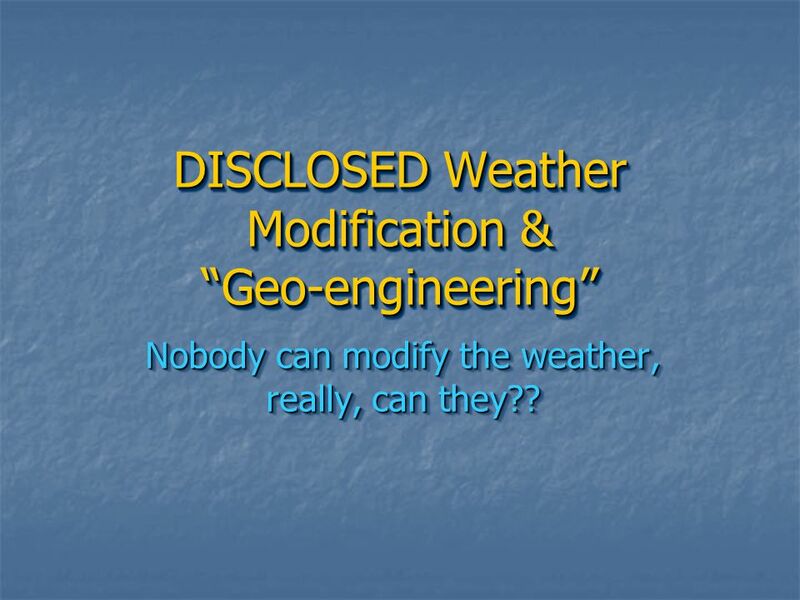 Nobody can modify the weather, really, can they?? 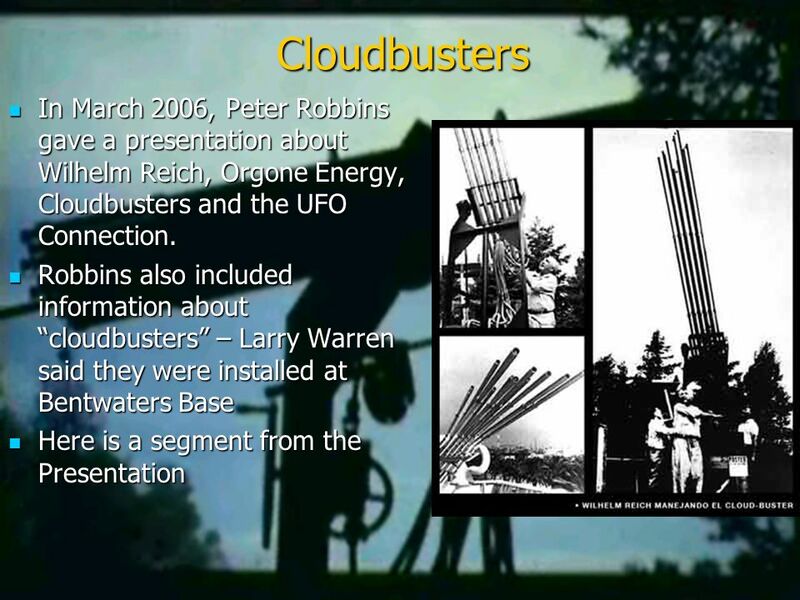 65 Geo-engineering Various operations have been going on for almost 100 years. 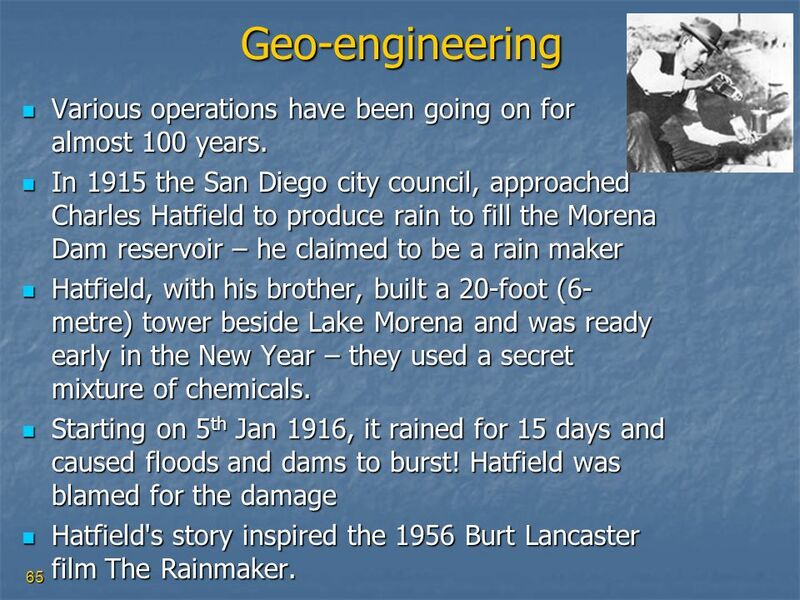 In 1915 the San Diego city council, approached Charles Hatfield to produce rain to fill the Morena Dam reservoir – he claimed to be a rain maker Hatfield, with his brother, built a 20-foot (6-metre) tower beside Lake Morena and was ready early in the New Year – they used a secret mixture of chemicals. 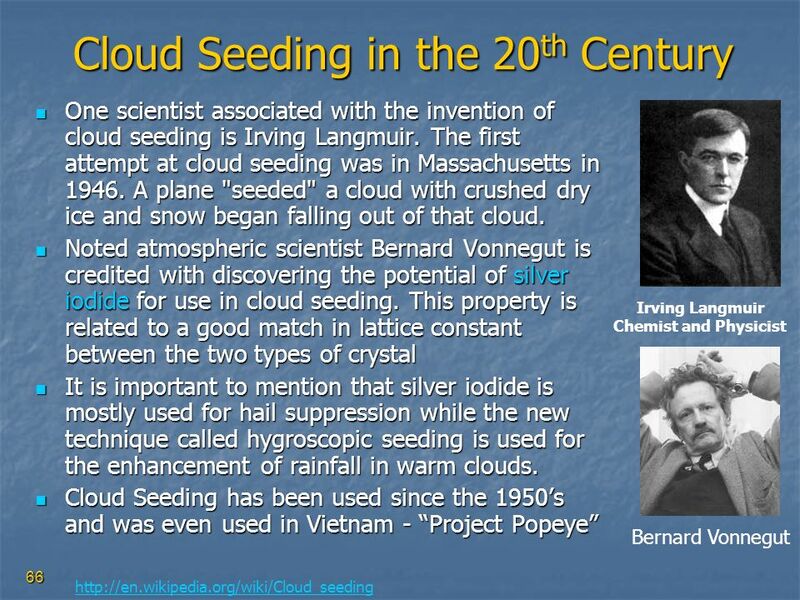 Starting on 5th Jan 1916, it rained for 15 days and caused floods and dams to burst! 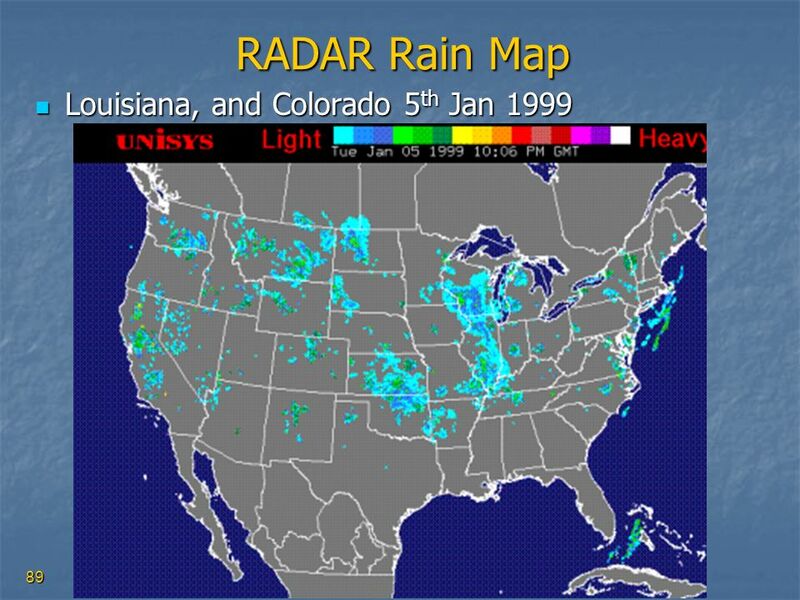 Hatfield was blamed for the damage Hatfield's story inspired the 1956 Burt Lancaster film The Rainmaker. 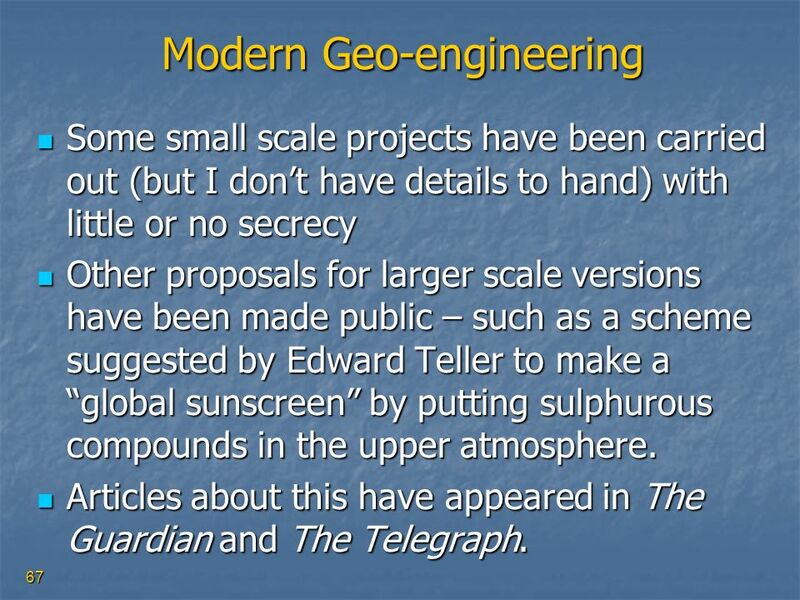 Some small scale projects have been carried out (but I don’t have details to hand) with little or no secrecy Other proposals for larger scale versions have been made public – such as a scheme suggested by Edward Teller to make a “global sunscreen” by putting sulphurous compounds in the upper atmosphere. 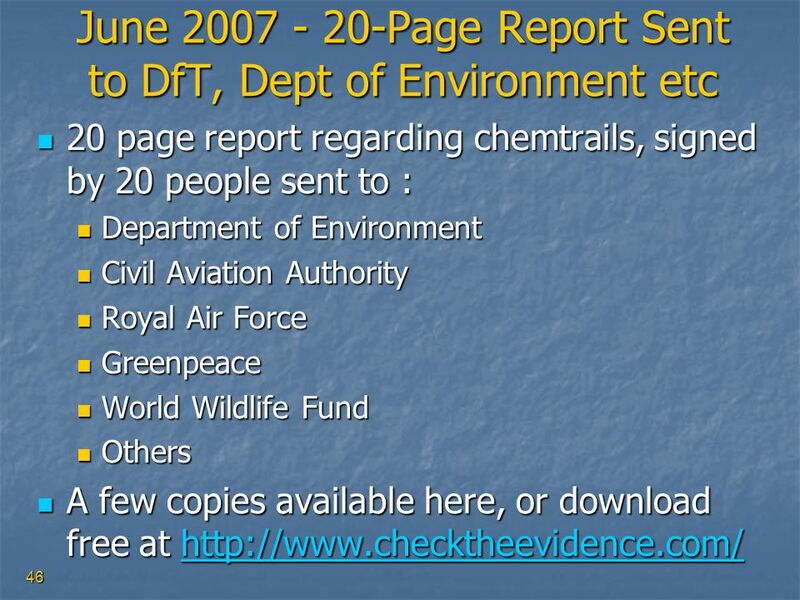 Articles about this have appeared in The Guardian and The Telegraph. 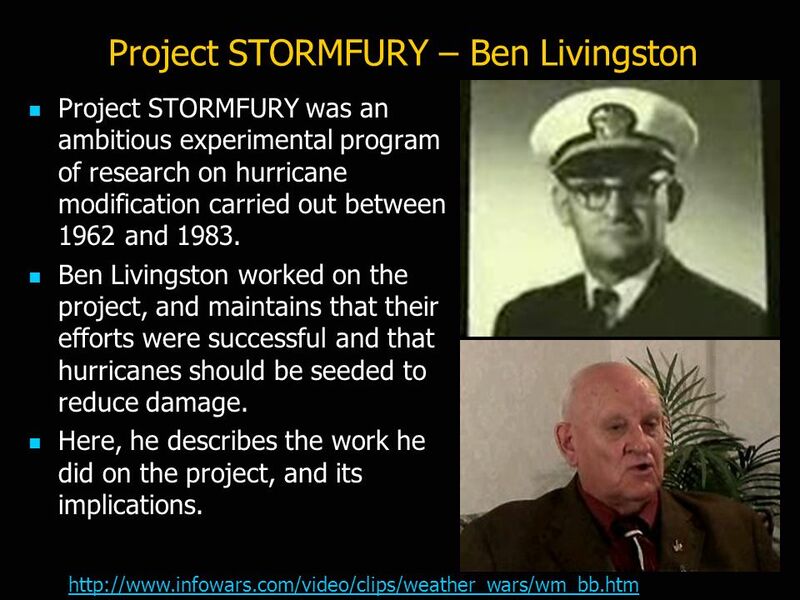 Project STORMFURY was an ambitious experimental program of research on hurricane modification carried out between 1962 and 1983. 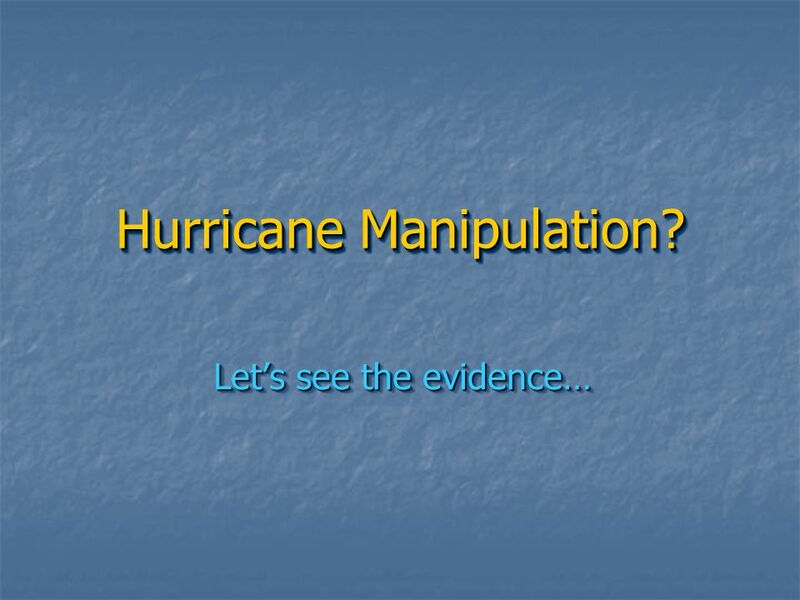 Ben Livingston worked on the project, and maintains that their efforts were successful and that hurricanes should be seeded to reduce damage. 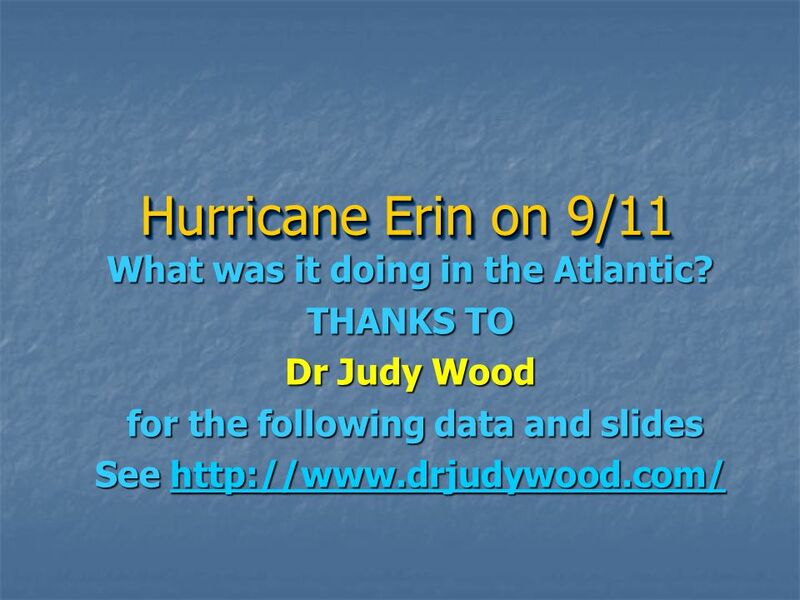 Here, he describes the work he did on the project, and its implications. 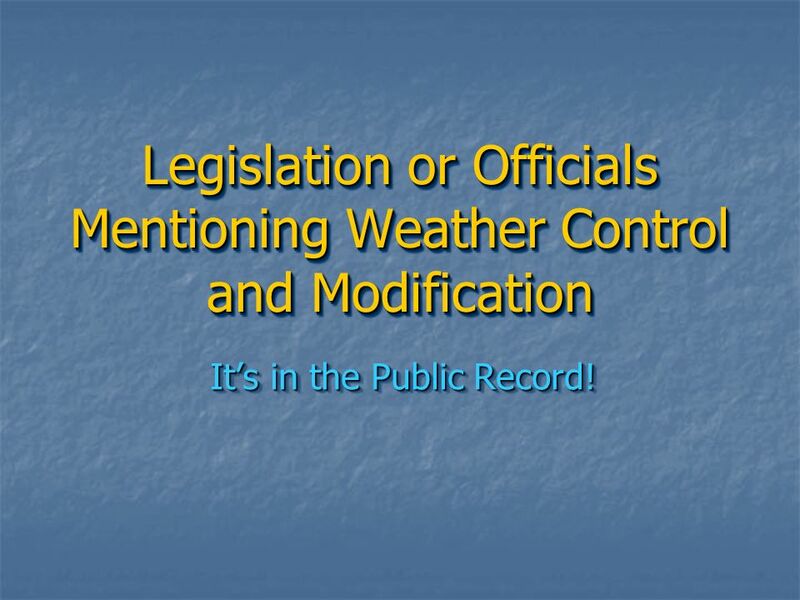 It’s in the Public Record! 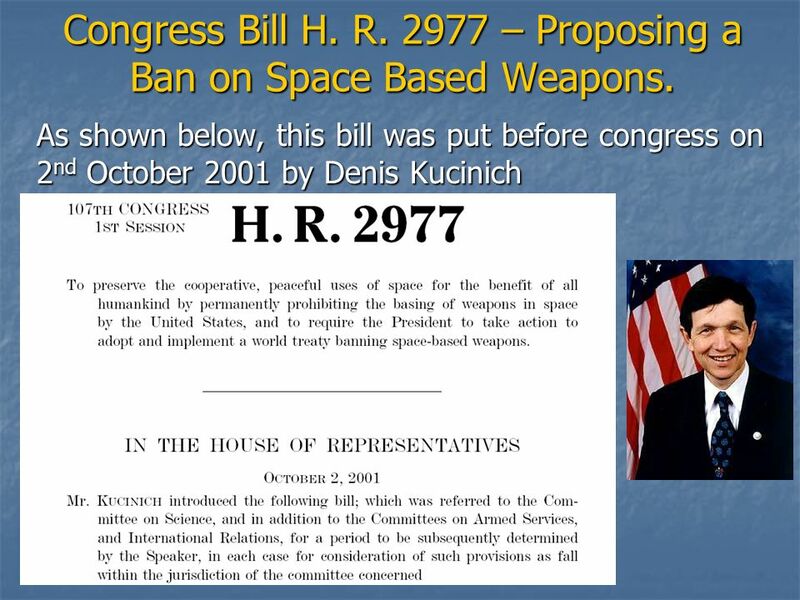 70 Congress Bill H. R. 2977 – Proposing a Ban on Space Based Weapons. 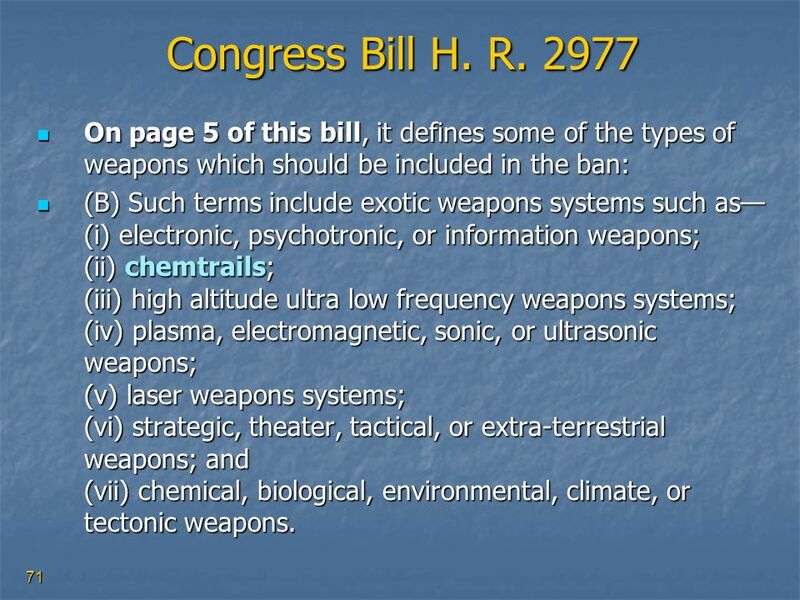 71 Congress Bill H. R. 2977 On page 5 of this bill, it defines some of the types of weapons which should be included in the ban: (B) Such terms include exotic weapons systems such as—(i) electronic, psychotronic, or information weapons; (ii) chemtrails; (iii) high altitude ultra low frequency weapons systems; (iv) plasma, electromagnetic, sonic, or ultrasonic weapons; (v) laser weapons systems; (vi) strategic, theater, tactical, or extra-terrestrial weapons; and (vii) chemical, biological, environmental, climate, or tectonic weapons. SEC. 2. PURPOSE. 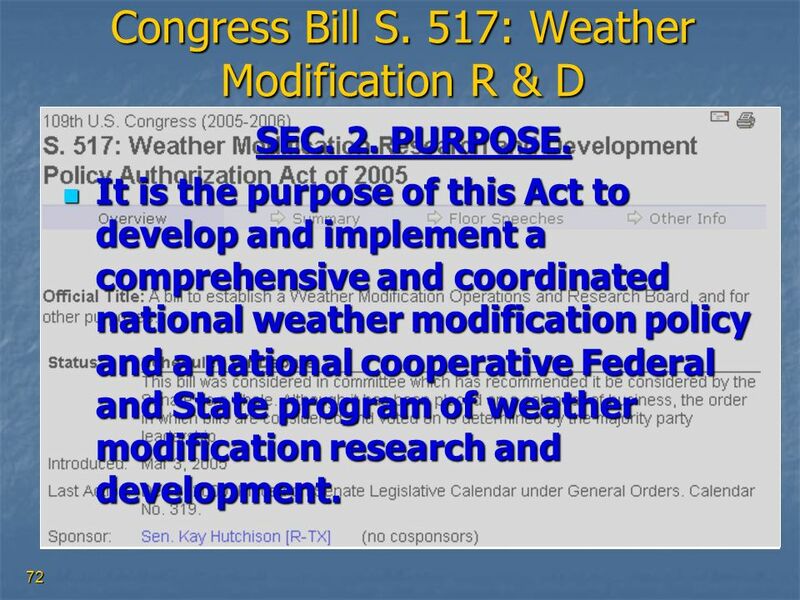 It is the purpose of this Act to develop and implement a comprehensive and coordinated national weather modification policy and a national cooperative Federal and State program of weather modification research and development. 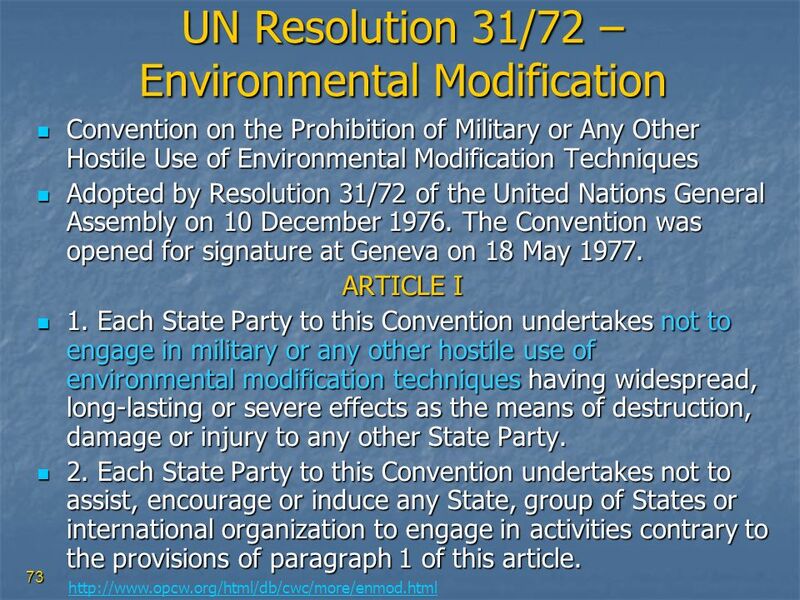 Convention on the Prohibition of Military or Any Other Hostile Use of Environmental Modification Techniques Adopted by Resolution 31/72 of the United Nations General Assembly on 10 December The Convention was opened for signature at Geneva on 18 May 1977. ARTICLE I 1. 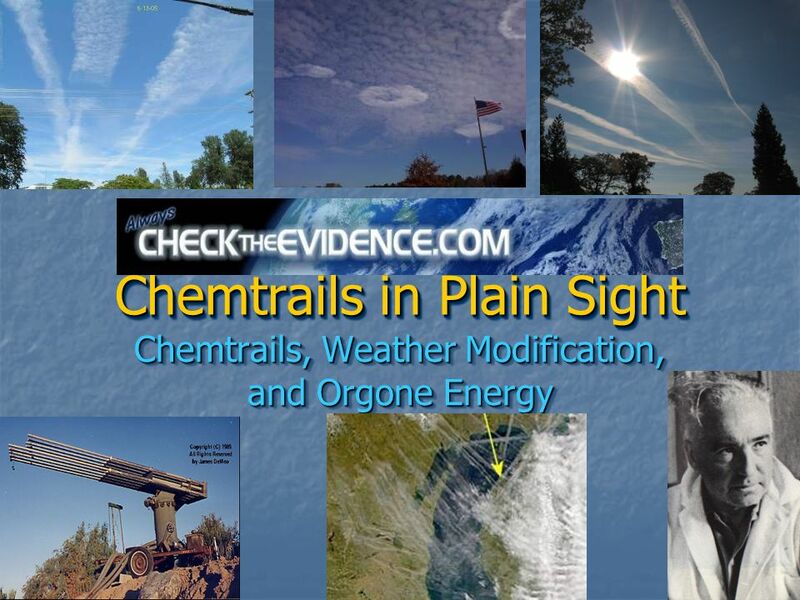 Each State Party to this Convention undertakes not to engage in military or any other hostile use of environmental modification techniques having widespread, long-lasting or severe effects as the means of destruction, damage or injury to any other State Party. 2. Each State Party to this Convention undertakes not to assist, encourage or induce any State, group of States or international organization to engage in activities contrary to the provisions of paragraph 1 of this article. 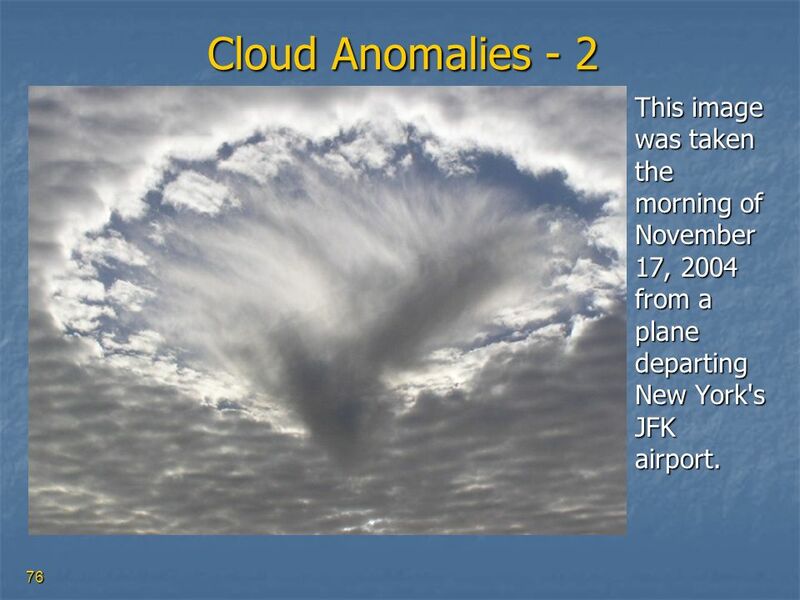 76 Cloud Anomalies - 2 This image was taken the morning of November 17, 2004 from a plane departing New York's JFK airport. 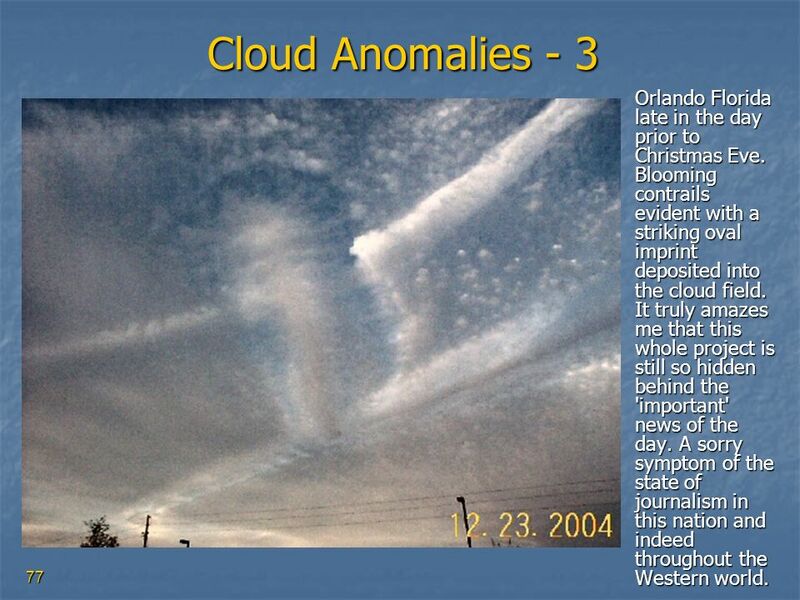 77 Cloud Anomalies - 3 Orlando Florida late in the day prior to Christmas Eve. 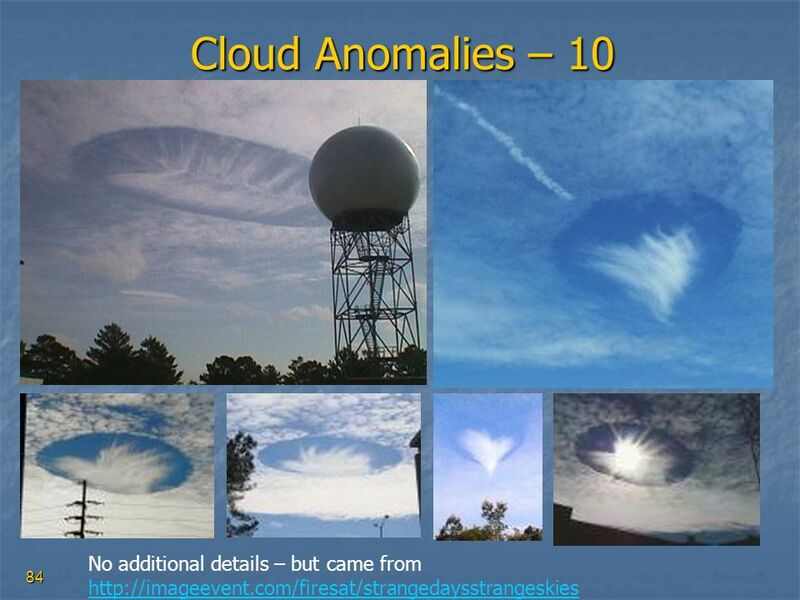 Blooming contrails evident with a striking oval imprint deposited into the cloud field. 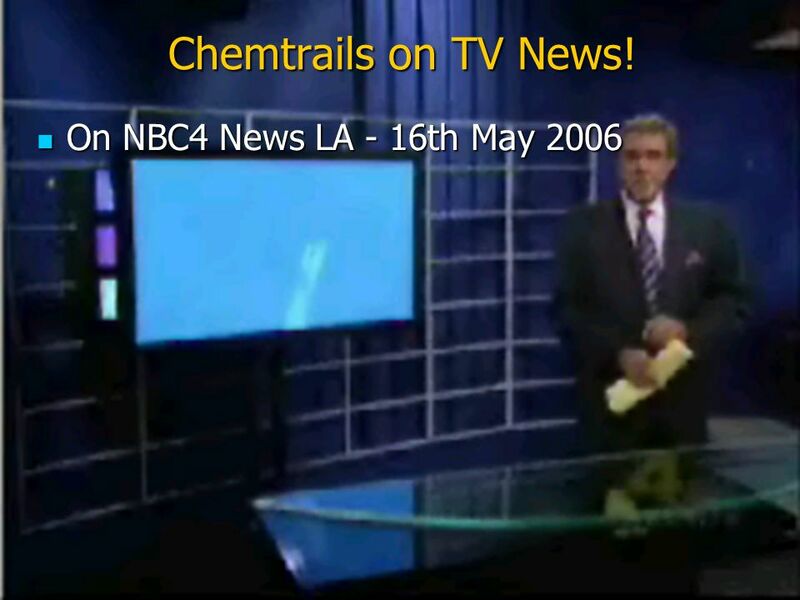 It truly amazes me that this whole project is still so hidden behind the 'important' news of the day. A sorry symptom of the state of journalism in this nation and indeed throughout the Western world. 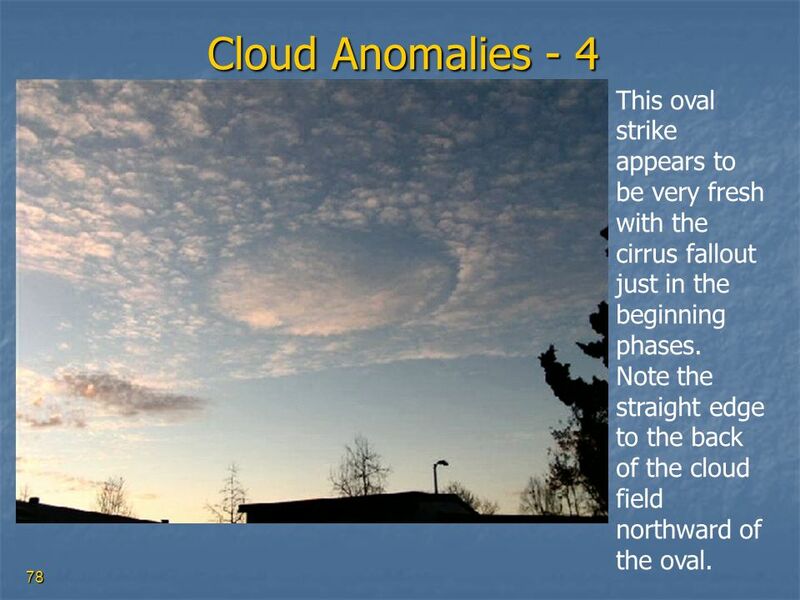 78 Cloud Anomalies - 4 This oval strike appears to be very fresh with the cirrus fallout just in the beginning phases. 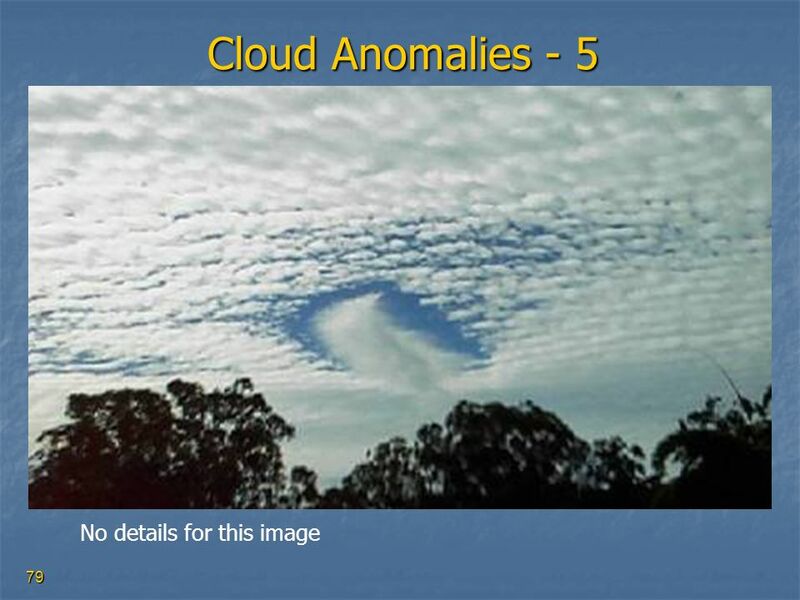 Note the straight edge to the back of the cloud field northward of the oval. 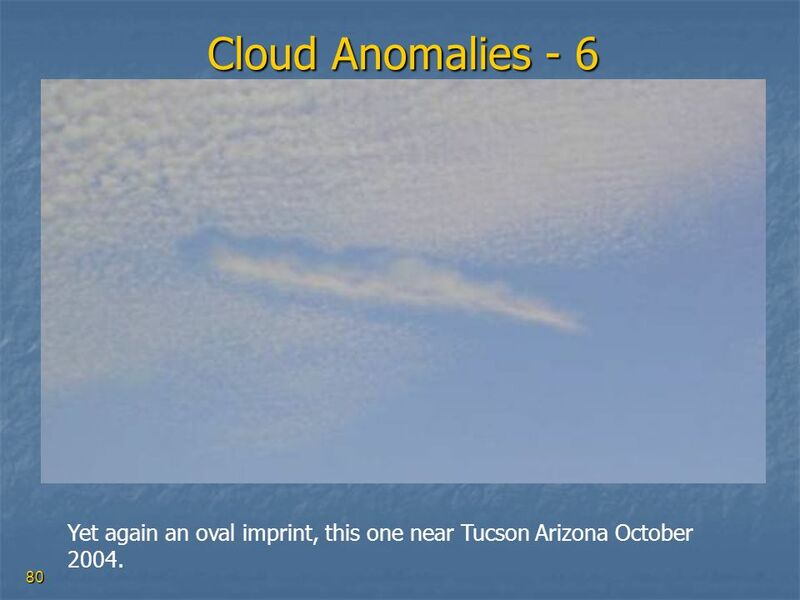 80 Cloud Anomalies - 6 Yet again an oval imprint, this one near Tucson Arizona October 2004. 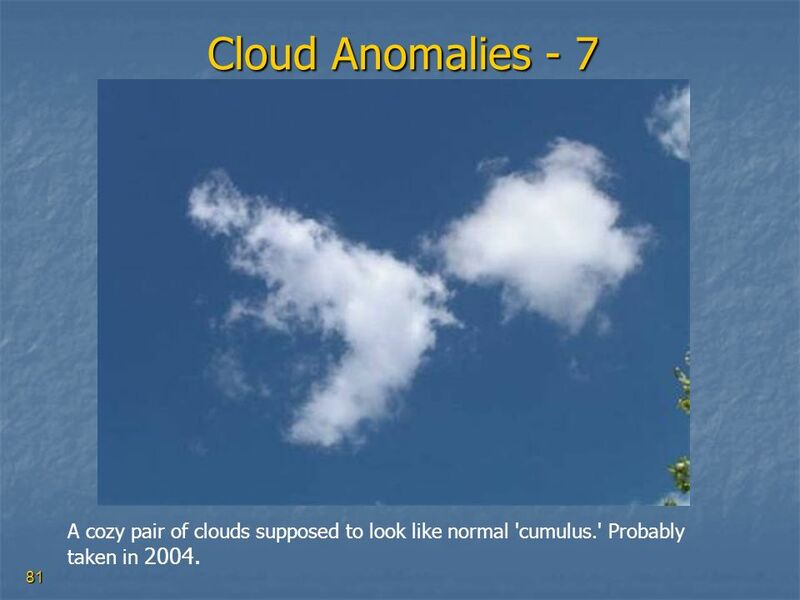 81 Cloud Anomalies - 7 A cozy pair of clouds supposed to look like normal 'cumulus.' 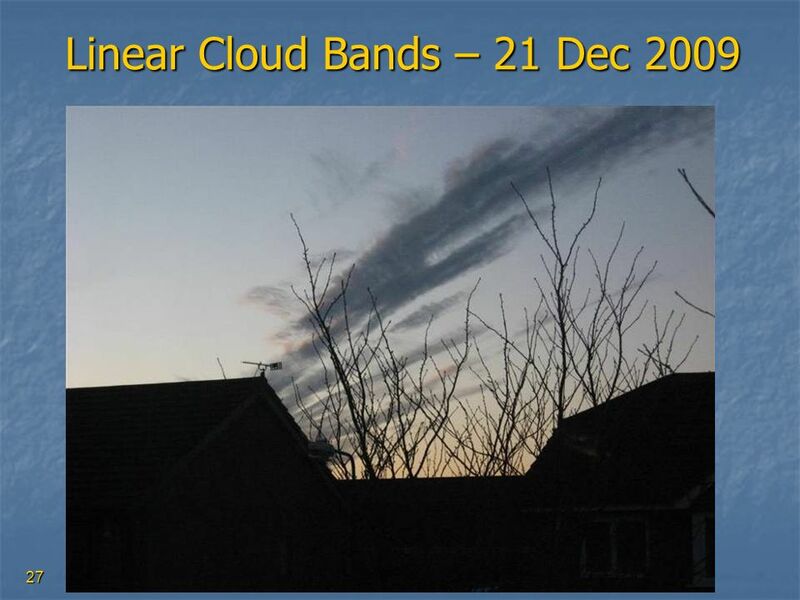 Probably taken in 2004. 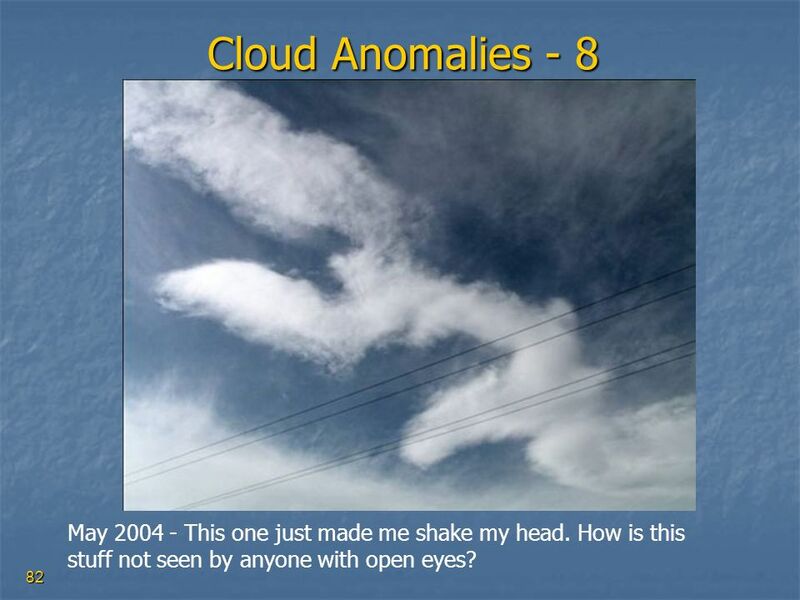 82 Cloud Anomalies - 8 May This one just made me shake my head. 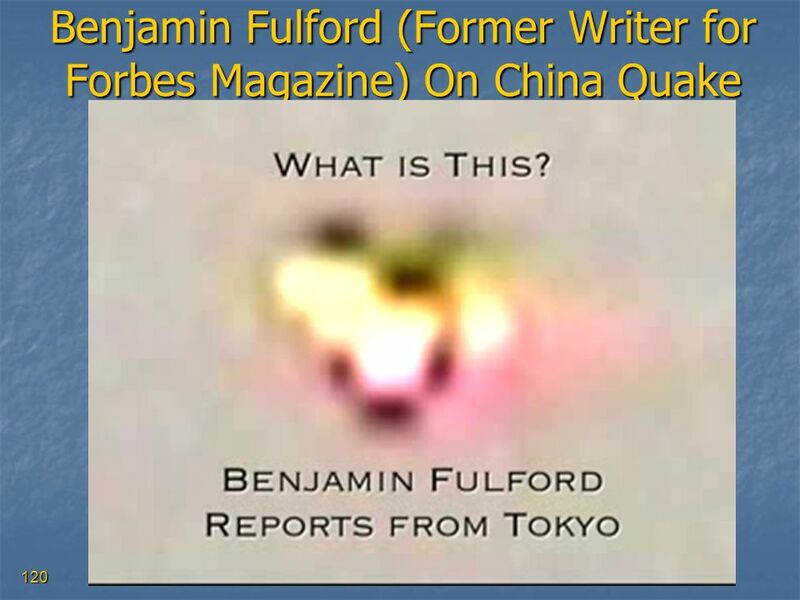 How is this stuff not seen by anyone with open eyes? 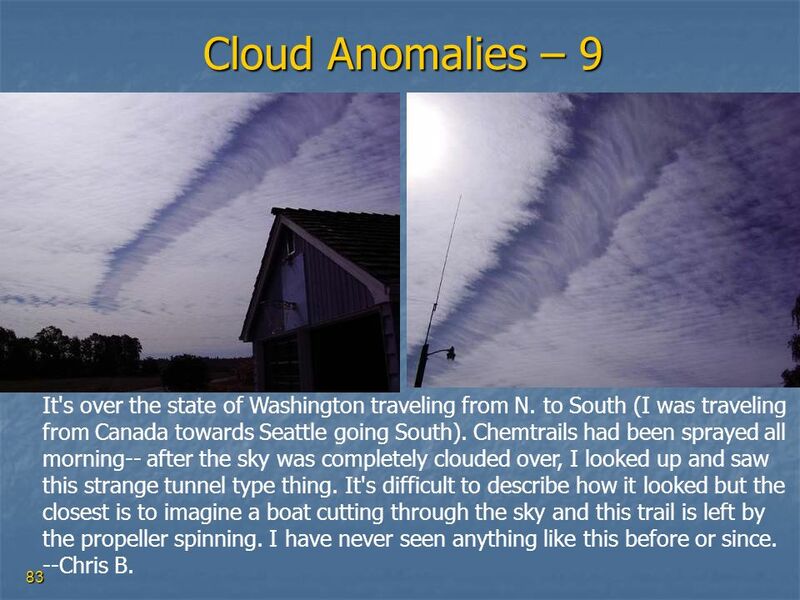 83 Cloud Anomalies – 9 It's over the state of Washington traveling from N. to South (I was traveling from Canada towards Seattle going South). Chemtrails had been sprayed all morning-- after the sky was completely clouded over, I looked up and saw this strange tunnel type thing. It's difficult to describe how it looked but the closest is to imagine a boat cutting through the sky and this trail is left by the propeller spinning. 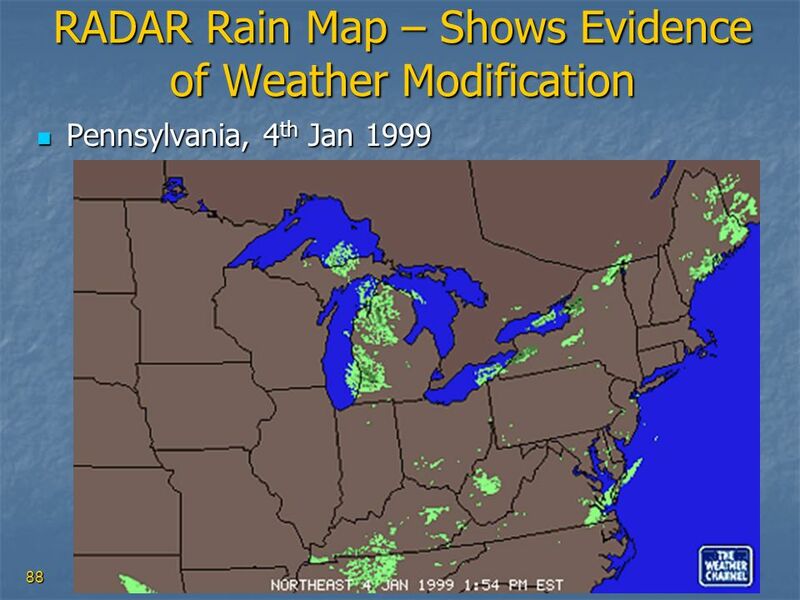 I have never seen anything like this before or since. --Chris B. 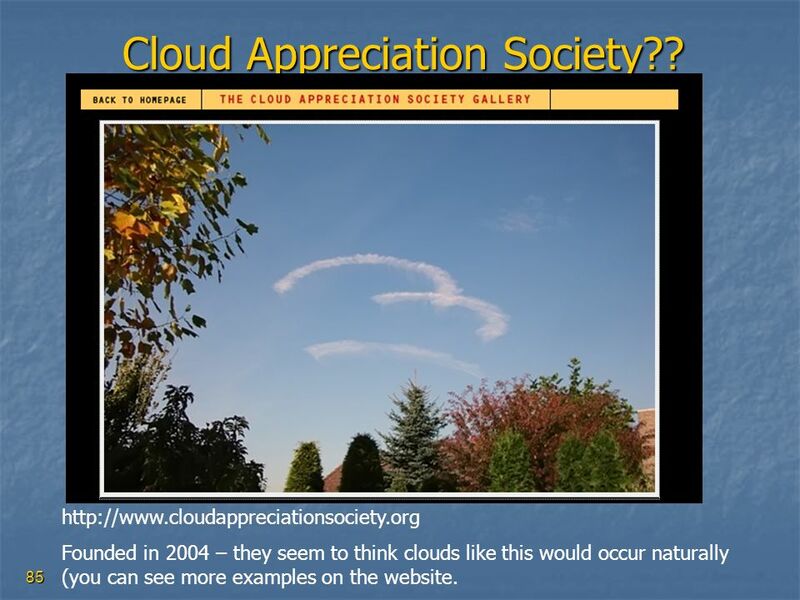 Founded in 2004 – they seem to think clouds like this would occur naturally (you can see more examples on the website. 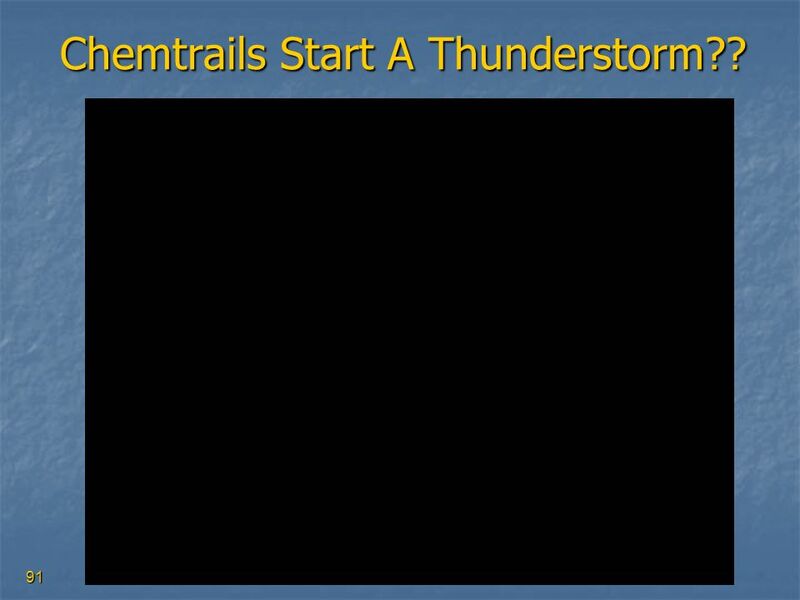 91 Chemtrails Start A Thunderstorm?? 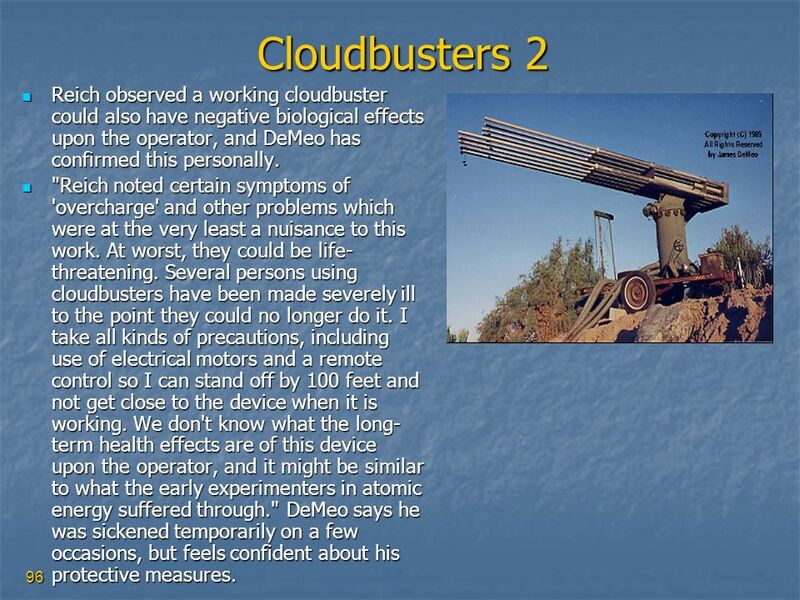 96 Cloudbusters 2 Reich observed a working cloudbuster could also have negative biological effects upon the operator, and DeMeo has confirmed this personally. 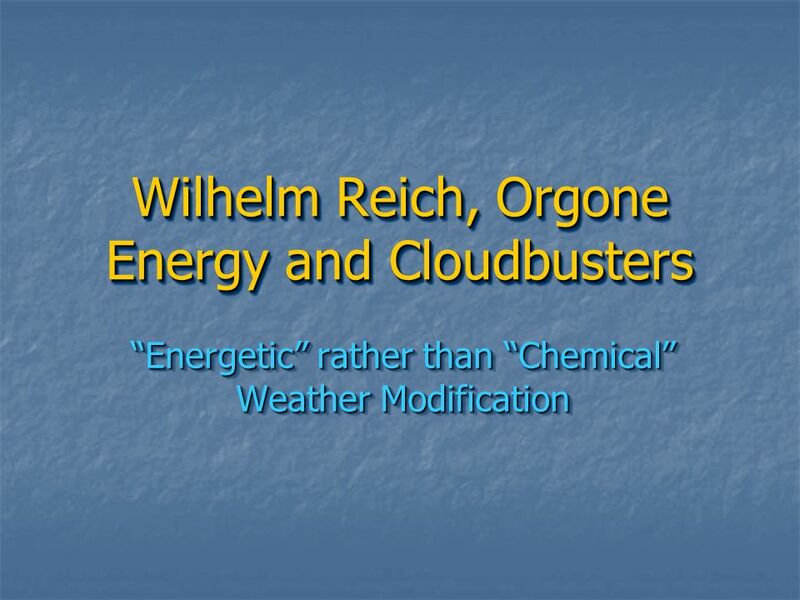 "Reich noted certain symptoms of 'overcharge' and other problems which were at the very least a nuisance to this work. At worst, they could be life-threatening. 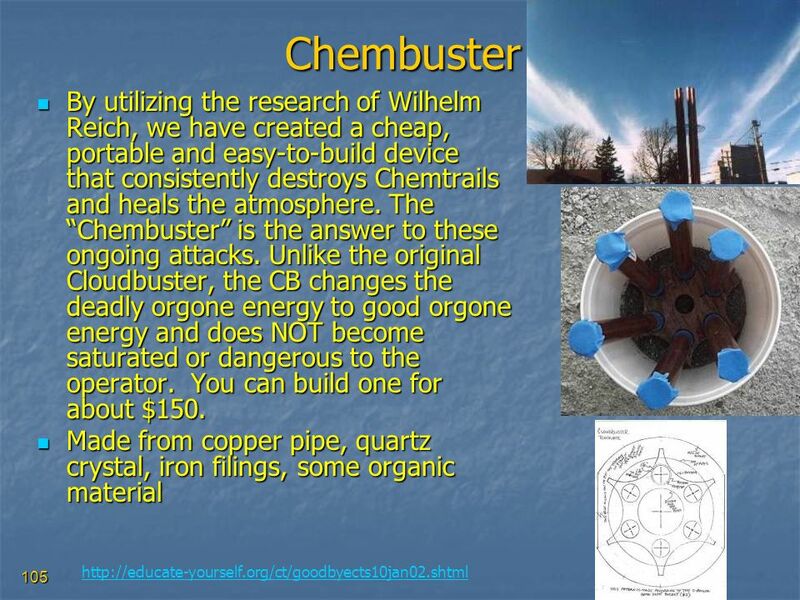 Several persons using cloudbusters have been made severely ill to the point they could no longer do it. I take all kinds of precautions, including use of electrical motors and a remote control so I can stand off by 100 feet and not get close to the device when it is working. 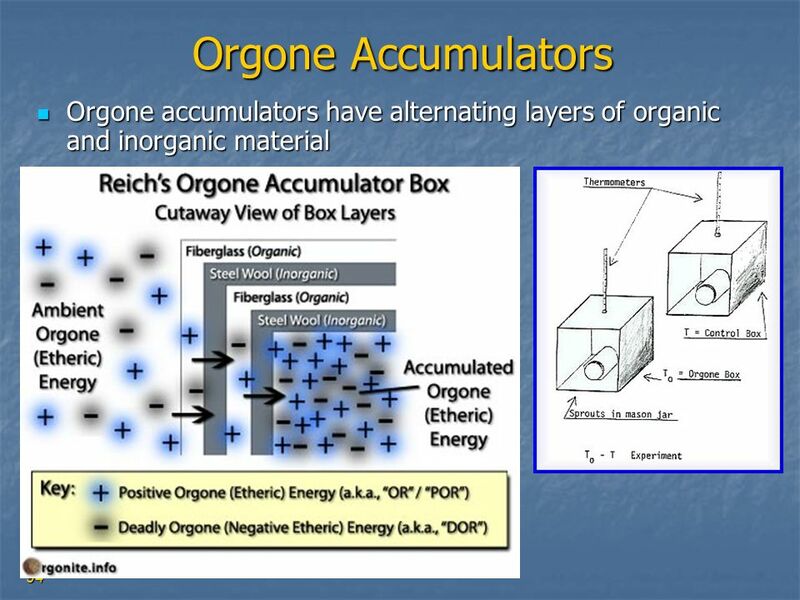 We don't know what the long-term health effects are of this device upon the operator, and it might be similar to what the early experimenters in atomic energy suffered through." DeMeo says he was sickened temporarily on a few occasions, but feels confident about his protective measures. 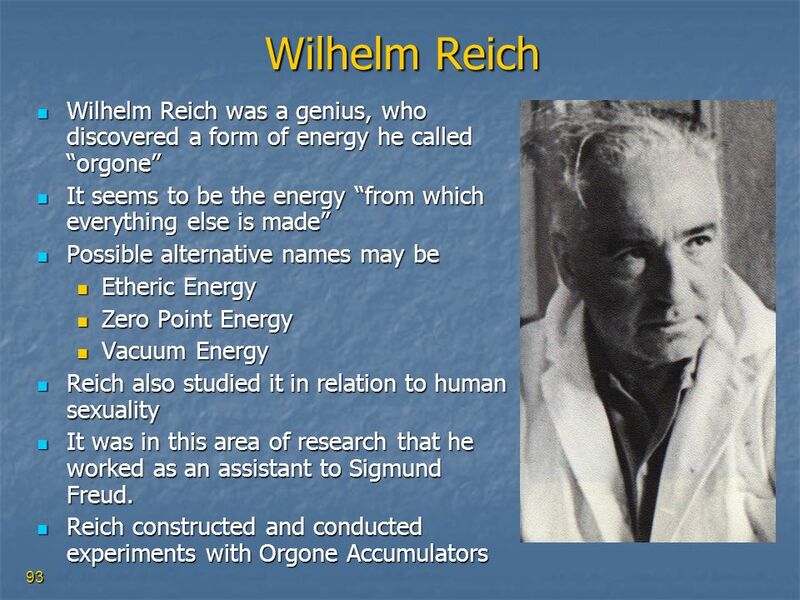 98 “I still dream of Organon”. 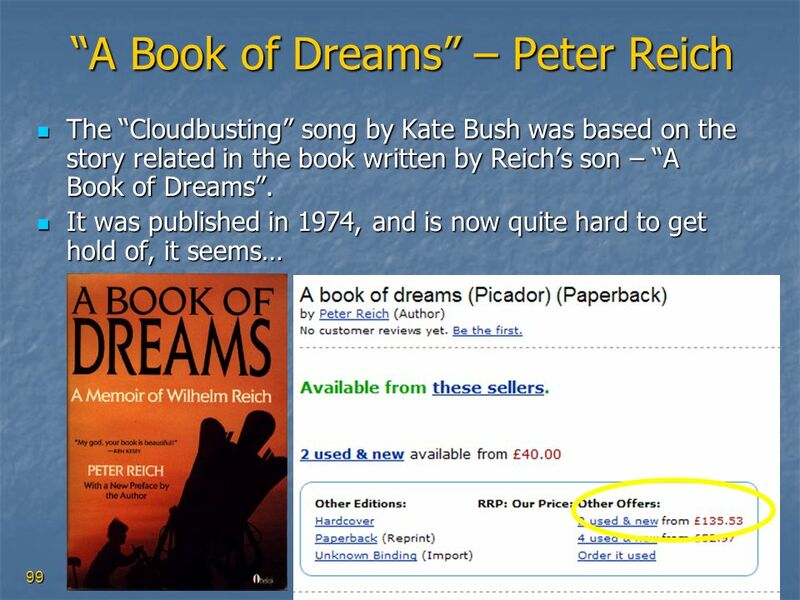 In 1985, Kate Bush featured a song called “Cloudbusting” on her album Hounds of Love I still dream of Organon. I wake up cryin'. You're making rain, And you're just in reach, When you & sleep escape me. You're like my yo-yo That glowed in the dark. What made it special Made it dangerous, So I bury it And forget. But every time it rains, You're here in my head, Like the sun coming out– Ooh, I just know that something good is gonna happen. And I don't know when, But just saying it could even make it happen. 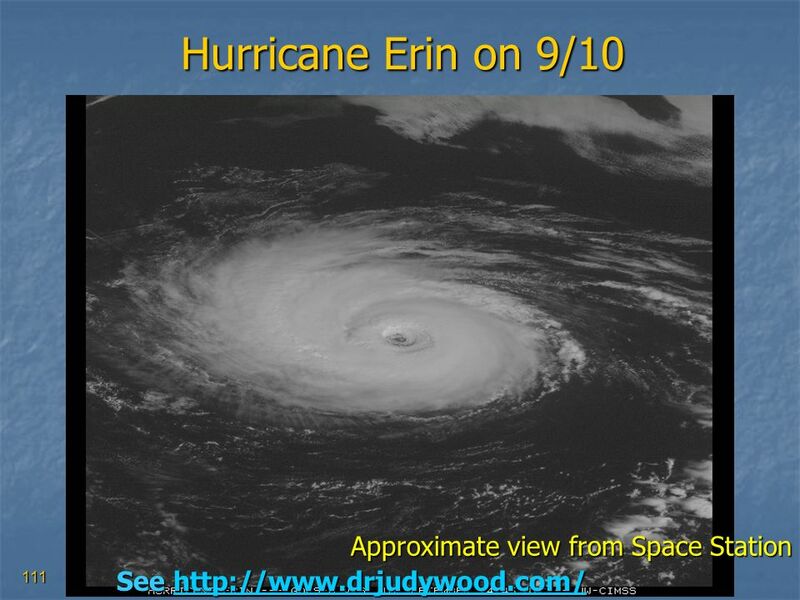 110 9/11 Morning Forecast – Where is Erin? 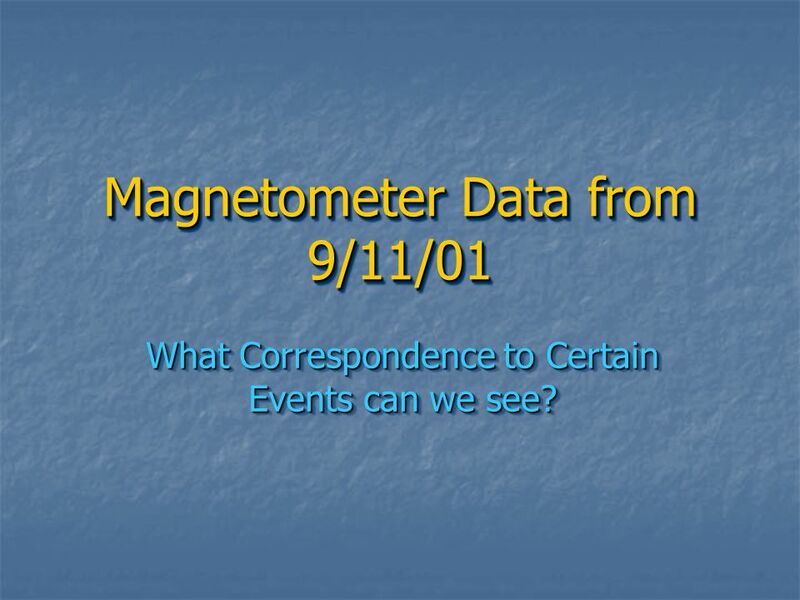 What Correspondence to Certain Events can we see? 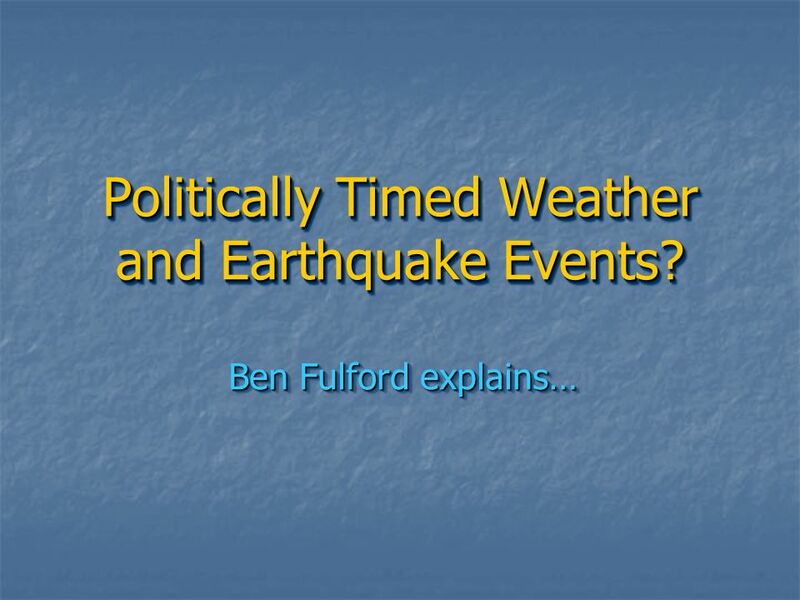 119 Politically Timed Weather and Earthquake Events? 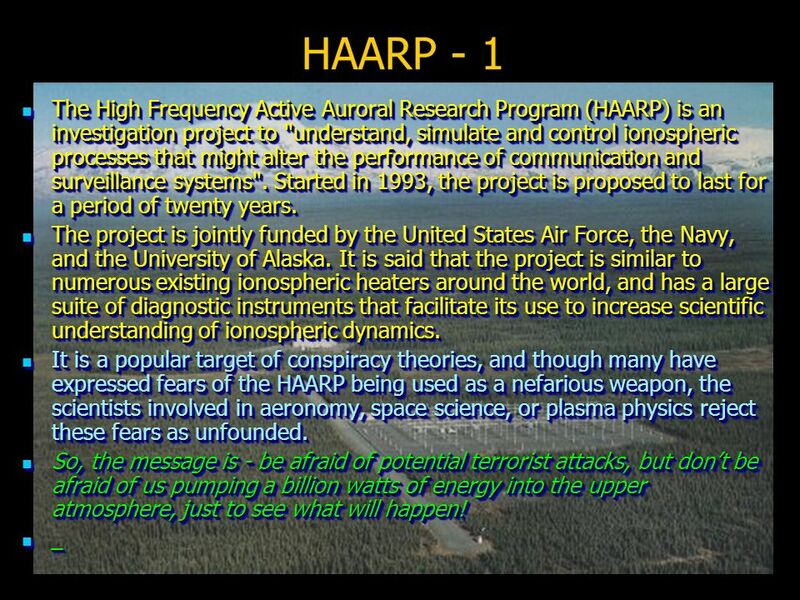 "Others [terrorists] are engaging even in an eco-type of terrorism whereby they can alter the climate, set off earthquakes, volcanoes remotely through the use of electromagnetic waves... 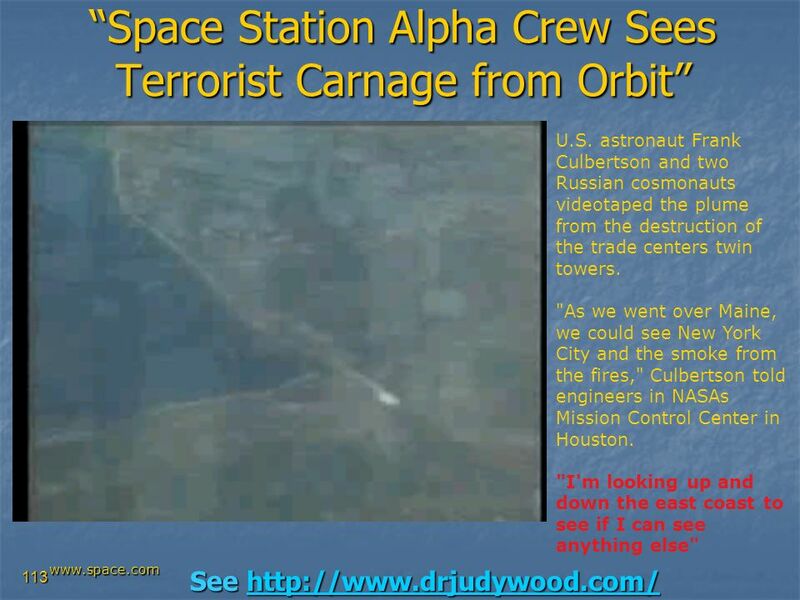 So there are plenty of ingenious minds out there that are at work finding ways in which they can wreak terror upon other nations...It's real, and that's the reason why we have to intensify our [counterterrorism] efforts." 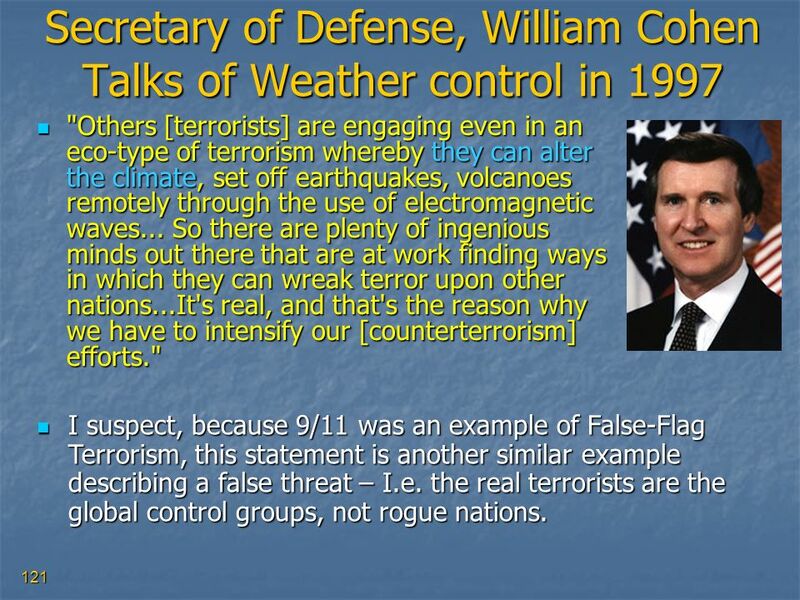 I suspect, because 9/11 was an example of False-Flag Terrorism, this statement is another similar example describing a false threat – I.e. 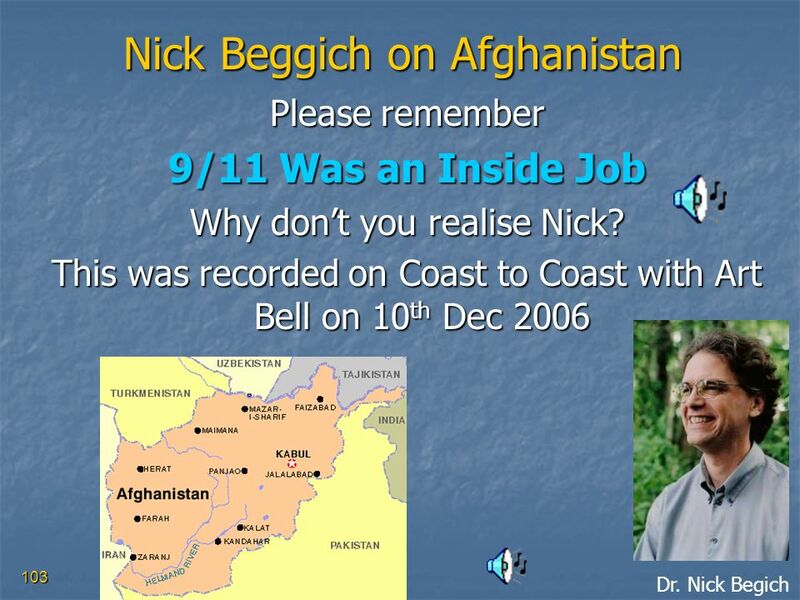 the real terrorists are the global control groups, not rogue nations. 123 What Does It All Mean? 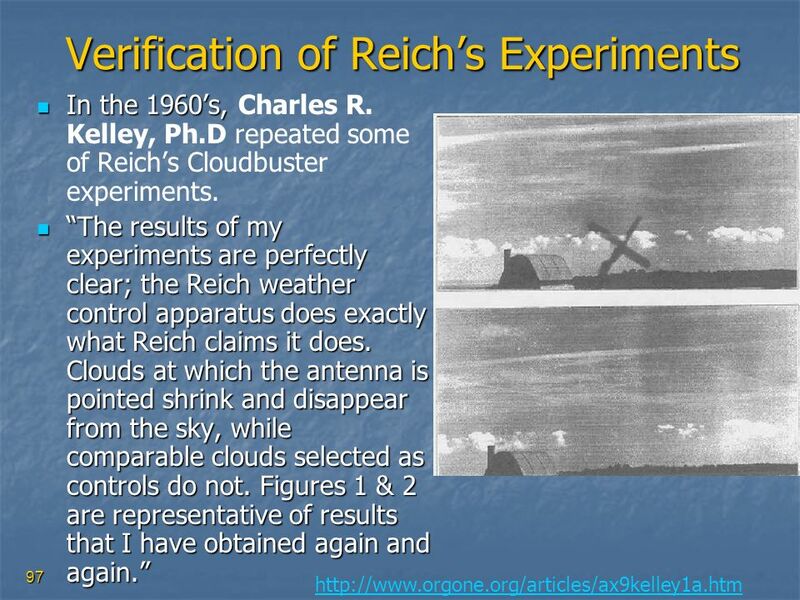 Weather Modification has been in use for years – both in public and secret projects It seems that Chemtrailing and “Advanced” Weather Modification are Black Projects. Their existence is Officially Denied. 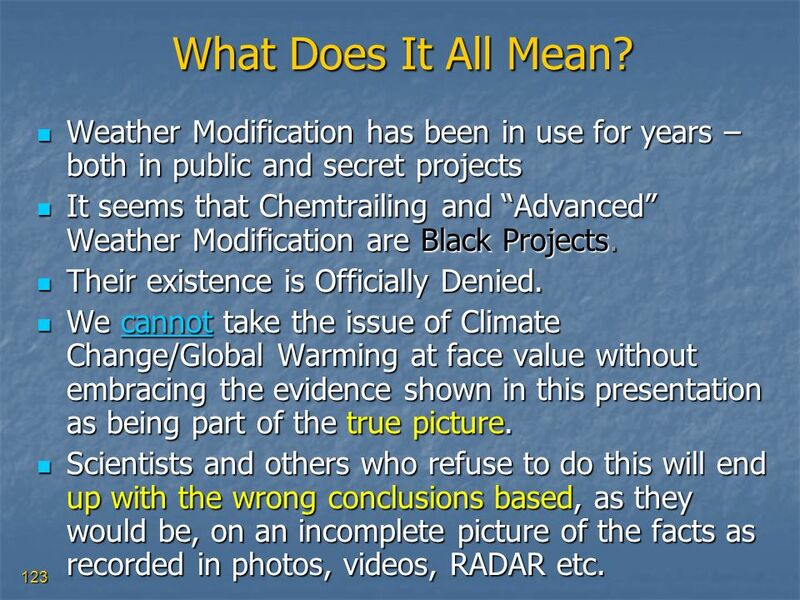 We cannot take the issue of Climate Change/Global Warming at face value without embracing the evidence shown in this presentation as being part of the true picture. 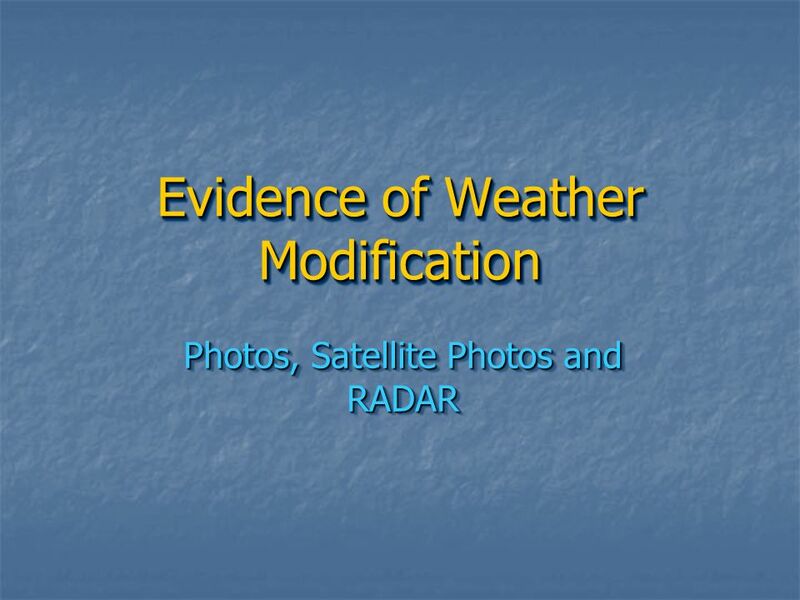 Scientists and others who refuse to do this will end up with the wrong conclusions based, as they would be, on an incomplete picture of the facts as recorded in photos, videos, RADAR etc. 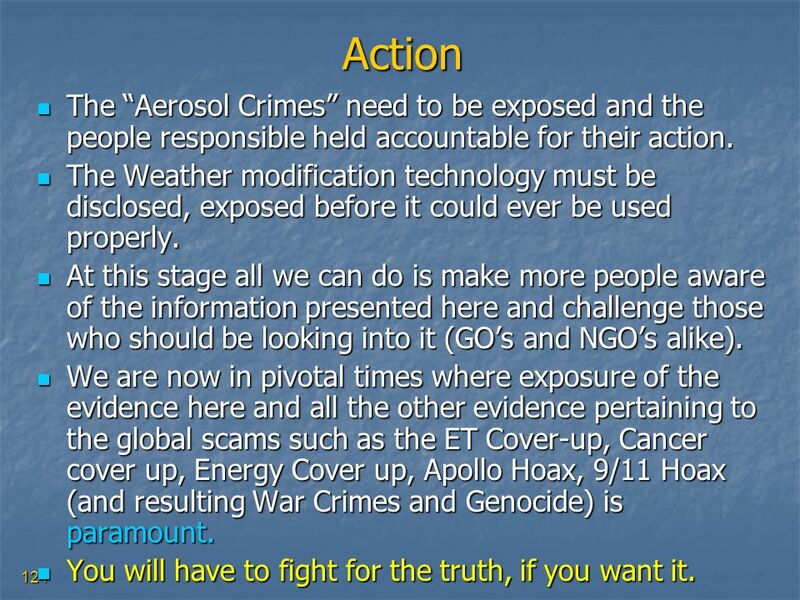 124 Action The “Aerosol Crimes” need to be exposed and the people responsible held accountable for their action. 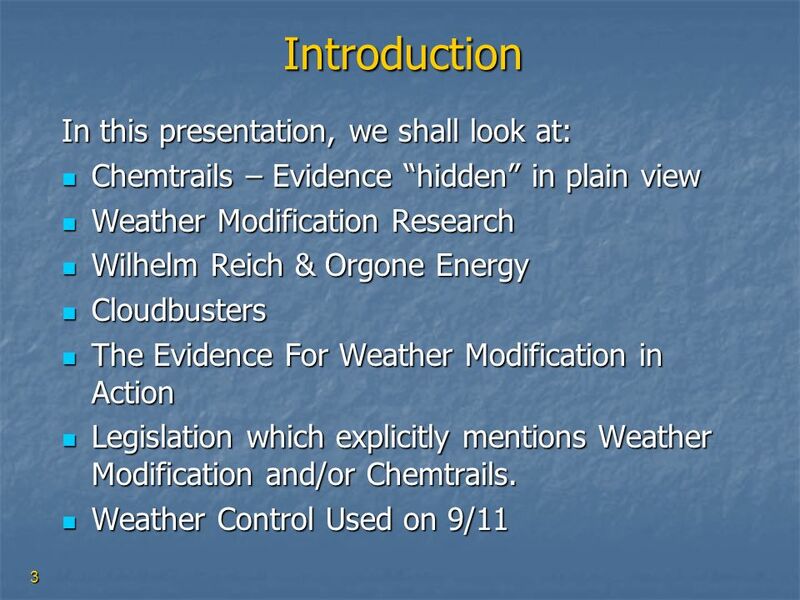 The Weather modification technology must be disclosed, exposed before it could ever be used properly. 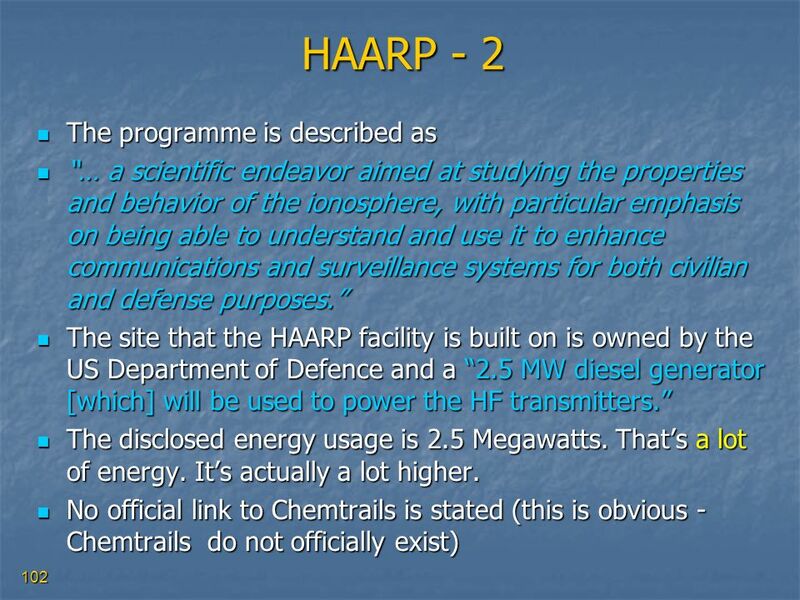 At this stage all we can do is make more people aware of the information presented here and challenge those who should be looking into it (GO’s and NGO’s alike). 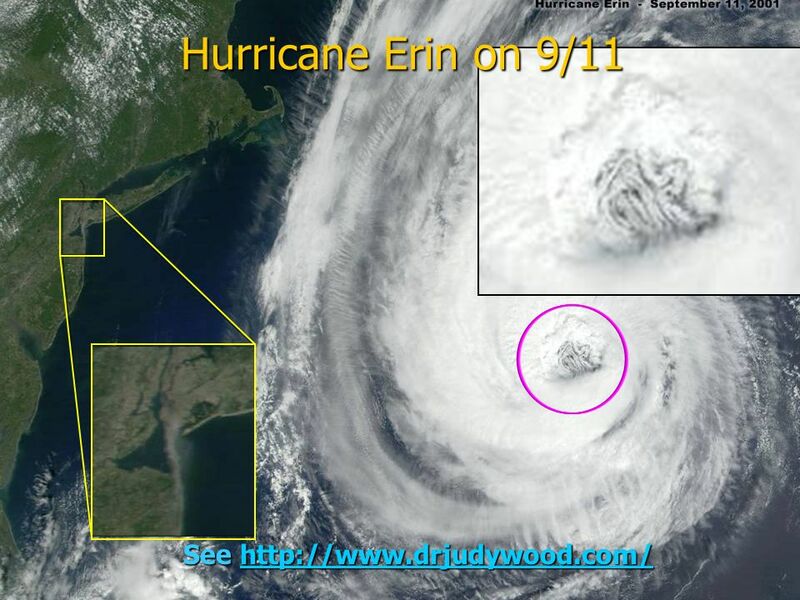 We are now in pivotal times where exposure of the evidence here and all the other evidence pertaining to the global scams such as the ET Cover-up, Cancer cover up, Energy Cover up, Apollo Hoax, 9/11 Hoax (and resulting War Crimes and Genocide) is paramount. You will have to fight for the truth, if you want it. 125 Thank you for listening! 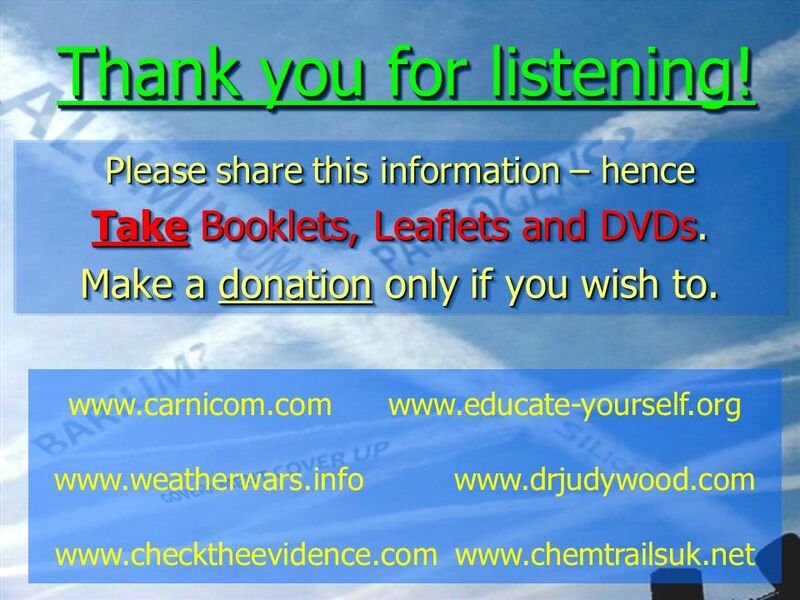 Please share this information – hence Take Booklets, Leaflets and DVDs. Make a donation only if you wish to. 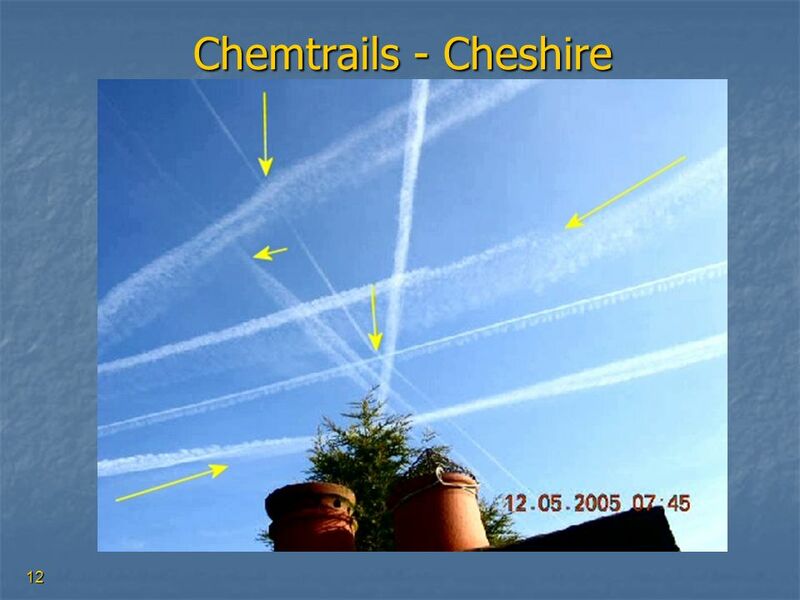 Download ppt "Chemtrails in Plain Sight"